It’s the end of summer and time for school to start. We got a list of school supplies we’re supposed to buy for Catherine. In the package of papers is a note from her PE teacher. Cat is supposed to have “sports shoes with traction, laces and arch support”. The PE teacher was quite specific about her request. Converse and Van sneakers, she says, are not the proper shoes for PE. When I read this, I could only think about all the different footware worldwide and what people can accomplish without the proper shoe. Most people wore sandals. Many of the sandals were leather, usually plain leather thongs or slides. Sandals were also made of rubber, jute, or often plastic. 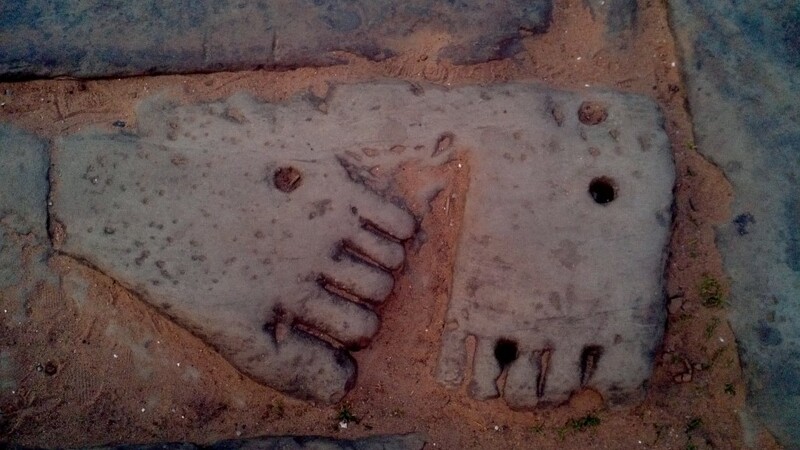 There were the sandals at Lake Titicaca, up at 14,000 feet, made from old rubber tires. We also saw sandals similar to these down at see level in Cambodia and in the war museums of Vietnam. Most sandals were plain, but sometimes the straps were engraved, painted, or even bejeweled. I bought a pretty pair of flip flops in Nairobi from a women’s work collective. The straps were leather and decorated with hand made ceramic beads. The soles were made of old tires. In Ho Chi Minh City, the capital of western clothing manufacturing, we bought discounted flip flops from Nike and Abercrombie & Fitch made of rubber, plastic, and nagahyde. We saw sandals everywhere on everyone. Muslim women in Doha with their faces covered in veils and their bodies covered with robes had their toes peeking out below shod in sandals covered in brightly colored jewels. Porters on the trail to Mt Everest carrying 60 kg loads and wearing Converse knock-offs sped past us up the hill. 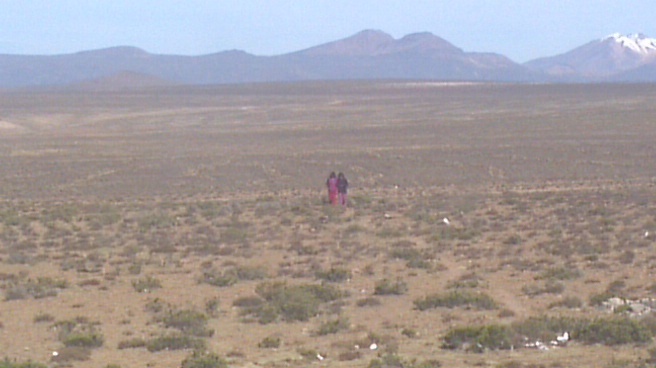 Even more depressing were the porters who were beating us up the trail wearing only sandals on their feet. 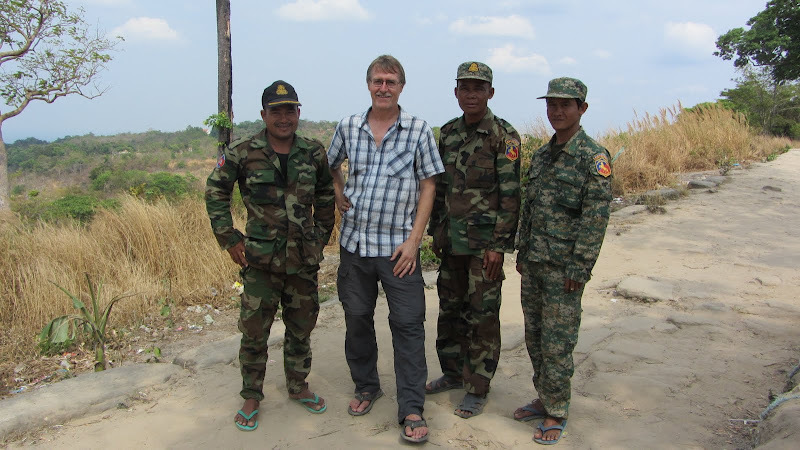 Cambodian soldiers fighting a war on the border with Thailand kicked the dirt in flip flops. 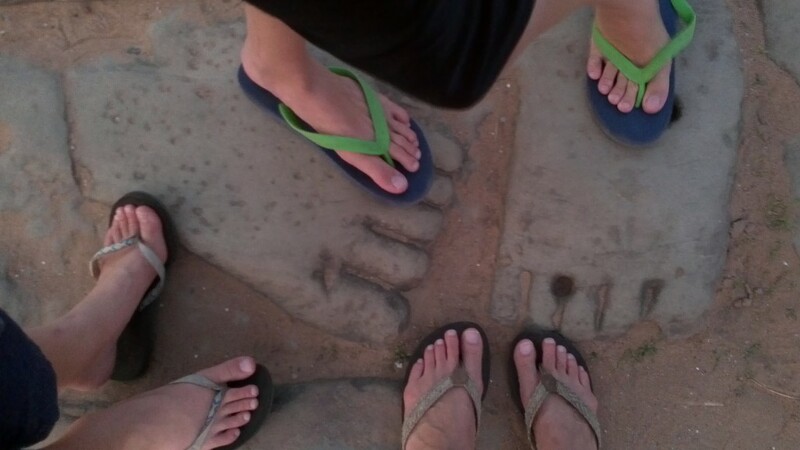 Sandals waited for their barefoot owner as he raked rice out to dry on a temple plaza in Battambang. 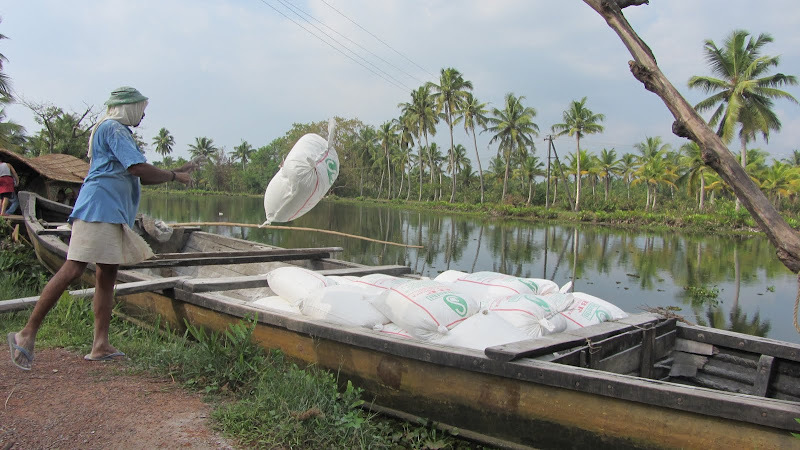 We watched in Kerala as workers carried heavy bags of lime to load into boats shod only in flip flops. A little boy in northern India with stumps for legs used sandals on his malformed hands to dash across the yard of his orphanage. 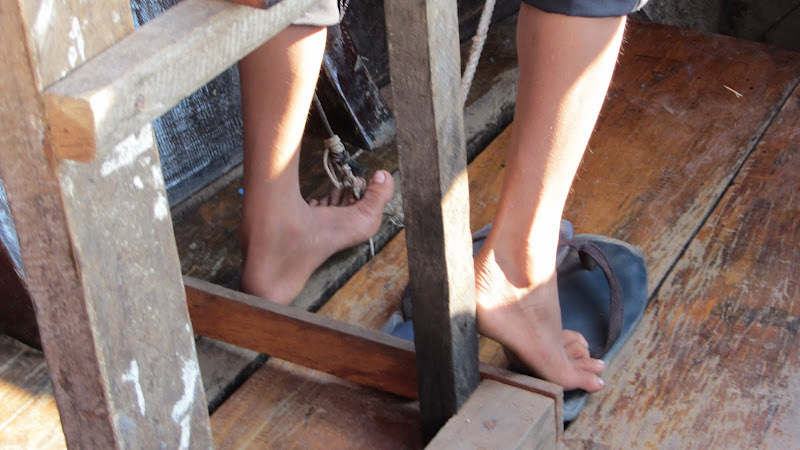 Our child pilot on Tonle Sap Lake in Cambodia kicked off his flip flops to power his boat. And there are many people who don’t have even flip flops to remove. 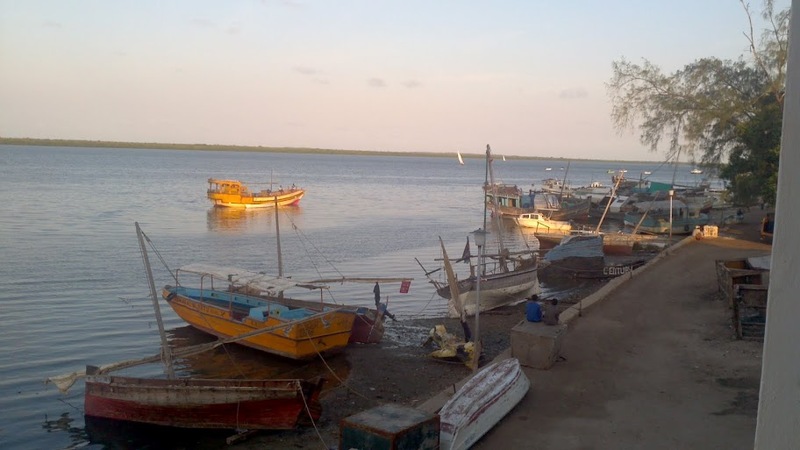 Barefoot children were common on the island of Lamu and the slums of Nairobi. There was no reason to wear shoes on the beaches of Kerala, the sand was so clean and soft. And no reason to wear shoes living in a floating village on Tonle Sap Lake. 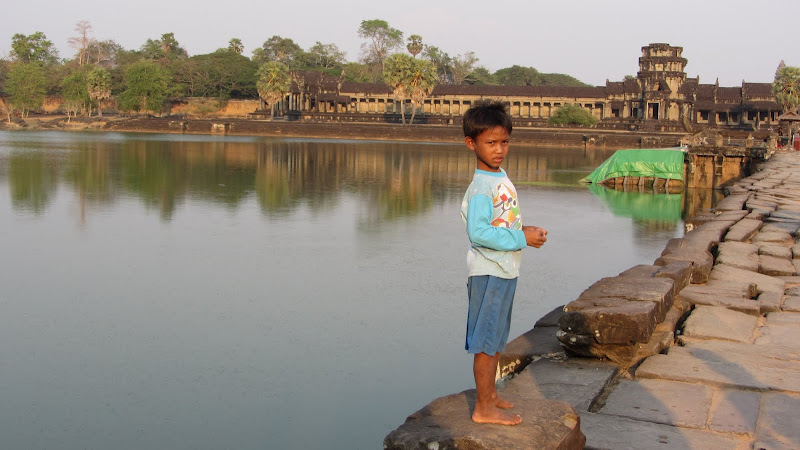 Kids sold their wares at the temples of Angkor Wat with nothing on their feet. A German hippy living at the organic farm in Thailand performed all his chores without shoes. 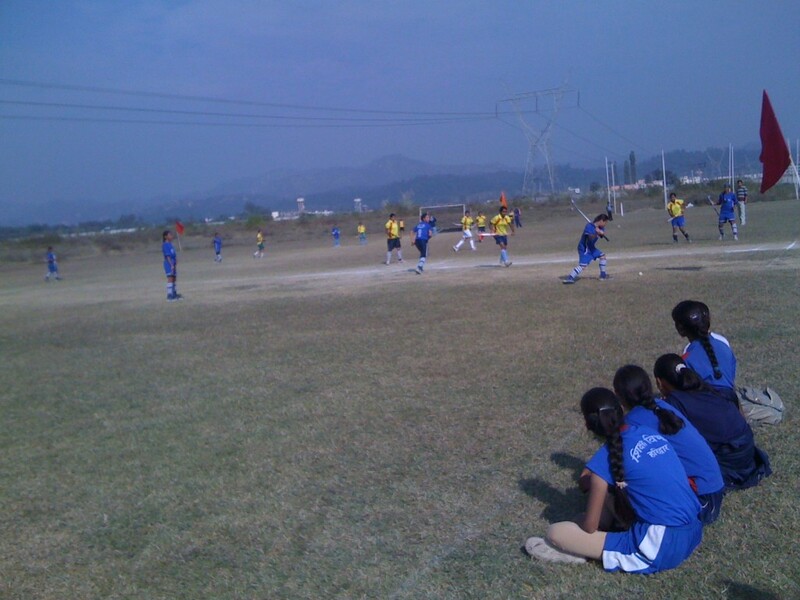 And there was the field hockey team in Haridwar who had no uniform let alone cleats. They played in their salwar kameez and bare feet. There were a number of places where our shoes were not allowed. At the Blue Mosque in Istanbul shelves lined the entrance for storing shoes of the faithful and the visitors. The little temple at the orphanage in India had shoes scattered about in front of the door twice a day as the kids entered for aarti. 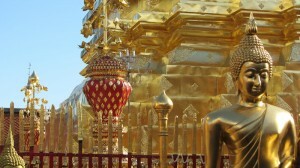 At Doi Suthep, a temple filled with buddhas and gold stupas in Chiang Mai, shoes were heaped in front of the entrance, while at the Akshardam temple in Delhi an attendant demanded a few rupees to ensure the safety of our pairs of shoes. 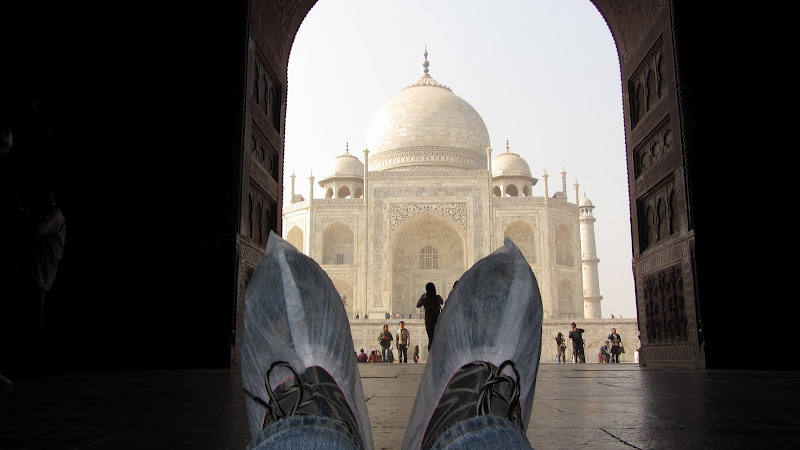 At the Taj Majal shoe covers were provided. Bill used them. I just took off my flip flops. 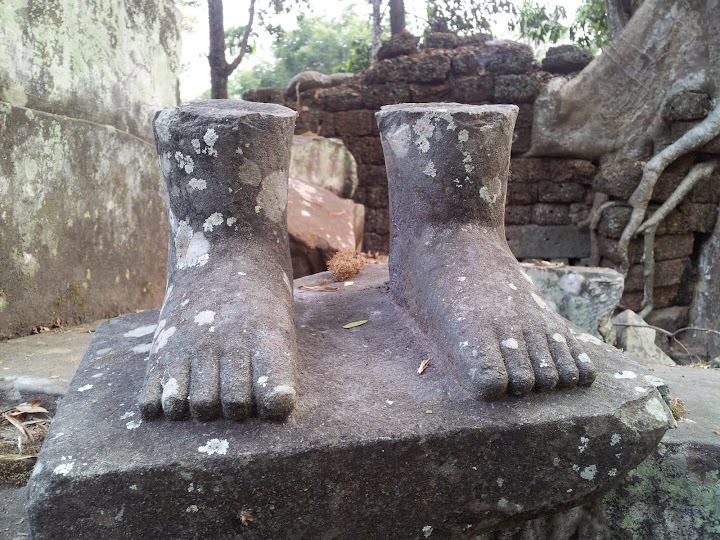 In Indonesia we took off our shoes before entering temples but also before entering home and stores. After months of taking off our shoes it felt sacrilegious to enter a cathedral in Peru wearing shoes on our feet. All of us are still preferring our flip flops now that we’re back in Oakland. But Bill and Hank have switched to sneakers for work and school. I’m wearing my flip flops around town and on long walks, but my feet are in clogs at work. Cat bought some ballet shoes for fashion but loves walking around in the green flip flops she bought in Saigon. On the trip Cat took a pair of running shoes. She wore them hiking in the canyons of Nepal and Peru. They traveled wrapped up in a plastic bag as she once stepped in dog poop somewhere in India. Their soles are pretty worn and the insoles have just a little cushion left. But they look the part for PE, and she’ll use them at school. It’s hard for me to invest in shoes she’ll barely wear. I understand the PE teacher’s need for good, safe footwear for her students, the proper shoes. But I’ll always be thinking about all the hard working people in flip flops around the world. 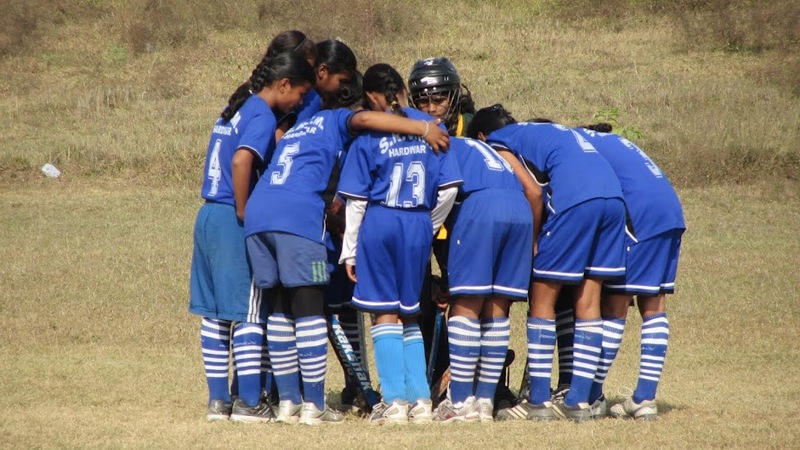 And I’ll remember the joy of the barefoot field hockey team in India, poorly equipped but out on the field playing nevertheless. The day before we left for this trip I went to get my haircut. I wanted to donate my ponytail. I’d done this several times before. It’s a really easy way to do good by somebody; the hair pretty much just grows itself. I had 10 1/2 inches to get rid of before heading to the heat of the tropics. Of course, while I was at the salon, all I could talk about was the impending trip. My hairdresser, Lisa Skinner, told anyone who walked into the shop that I was leaving to go travel around the world for a year. She was excited and impressed by our adventure. But the excitement was deflated when one man replied, “That sounds dangerous.” It was such a strange thing to hear. I didn’t know how to respond. I had thought about possible dangers and tried to prepare for them. Still it was never the first thing I thought of when planning the trip. But, it turns out, this guy was right. 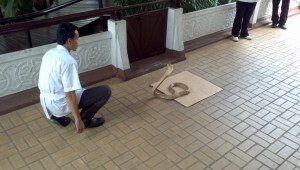 We did encounter danger. Every time someone got a hair cut. 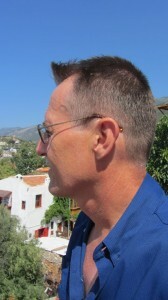 Bill was the first to experiment with the barber. It was in Turkey. There the traditional arts of the barber are alive and well. The barber slapped hot towels on his face when he sat down in the chair. When they cooled, the barber laid another hot towel across Bill’s face. Next was the soapy lather brushed on in tight swirls across his beard. The barber ran the long straight blade through the foam. Then with scissors in hand, he cut Bill’s hair. Short. When I married Bill he had a ponytail. After the barber, Bill looked like he had just started bootcamp. But the real excitement started after the haircut. 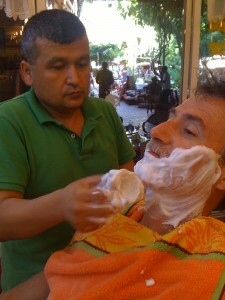 For the true polish of a Turkish haircut and shave the barber pulled out a long metal skewer with a large wad of cotton on the tip. With a match, this device became a torch. The barber ran the flames across Bill’s face, ears, and eyebrows singing any wayward hairs back to the level of their peers. The barber was a master. There were no nicks. There were no burns. Bill had escaped danger. At the end the barber and his young son massaged his shoulders and arms. Bill needed to relax after the harrowing experience. Hank also had a Turkish haircut. Hank had always had longish hair. It looked best after swimming in the ocean when he had true crunchy surfer’s hair. But usually it was just flat and either too long or too short. 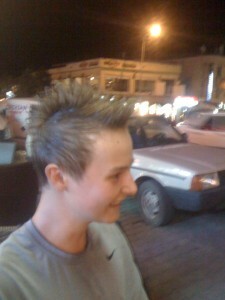 In Ürgüp, Cappadocia, we convinced him to change his hair. But it wasn’t just a hair cut. He got a style. Half a bottle of gel later his hair was slicked forward on the sides, and the top of his head stood straight up. This caused a lot of injury. To his ego. But things got better for Hank. His next haircut was in India. Unfortunately, I didn’t bring a camera, so I will try to build the scene with words. We went to find the barber whom the orphanage calls when all 25 boys need haircuts. We wandered through the village and found the barbershop on the side of the highway. The word barbershop brings up an image not quite true to what was there. 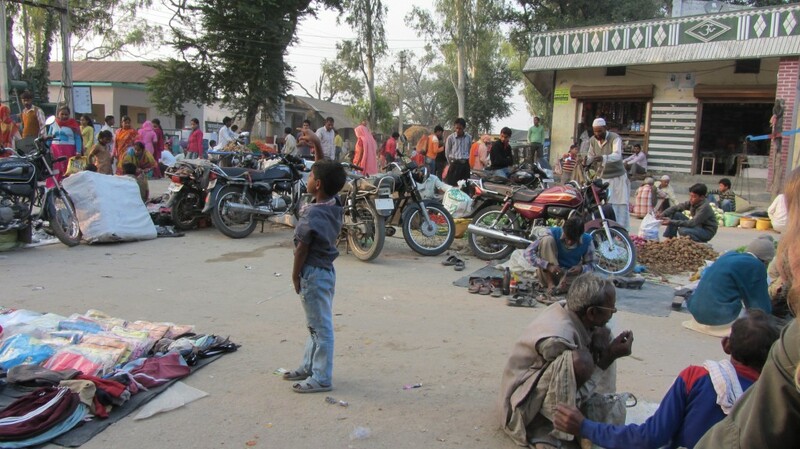 It was more of a barbershack, 20 feet from the bustle of the road. The building couldn’t have been more than seven feet in each direction; three walls and a roof made of corrugated steel. The fourth wall was open so I could watch all that took place as Hank got his trim. There was a bench along one wall where the future customers waited, mirrors on the opposite wall, two barber chairs between, and one bare light bulb hanging from the ceiling illuminating the scene. I approached the barber to ask how much for a haircut. “Five,” he replied. “Five what?” I asked, “Five rupees? Five hundred?” “Ten,” he responded. Okay, ten. My bargaining skills were sizzling that evening. The sun was going down with darkness blanketing the shack. The light from the single bulb made the scene glow from the inside. Hank waited on the bench inside while I watched the play of characters from outside. Both chairs had a barber trimming the hair of dark skinned Indian men. Four or five more men sat on the bench next to my overly fair boy while waiting for an empty barberchair. Hank was an anomaly in looks and sound as his American voice couldn’t blend with the Hindi bouncing around the shack. It was finally his turn for a hair cut, and he took a seat. Hand gestures were made to indicate what type of haircut he wanted and just how short it should be. There was little common language. This led to some doubt as to how successful this haircut would be. The scissors flew across his head. A young apprentice of maybe 10 years was sweeping the falling hair and grabbing tools as the barber needed them. The last step was the straight blade to shave the hair on Hank’s neck. The apprentice grabbed the blade, gave it to the barber, and the barber started shaving. That’s when the lights went out. It was dark. 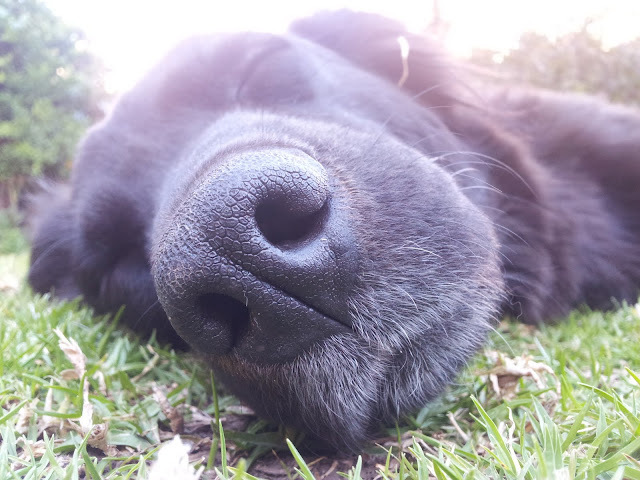 Hank didn’t move. He wanted to avoid an accidental slice across his neck. He was, he believed, in mortal danger. But five or ten minutes later the lights came back on, and the last of Hank’s overgrown hairs were shaved away. As he finished I payed the barber the 10 rupees. The haircut was perfect. It cost all of 20 cents. 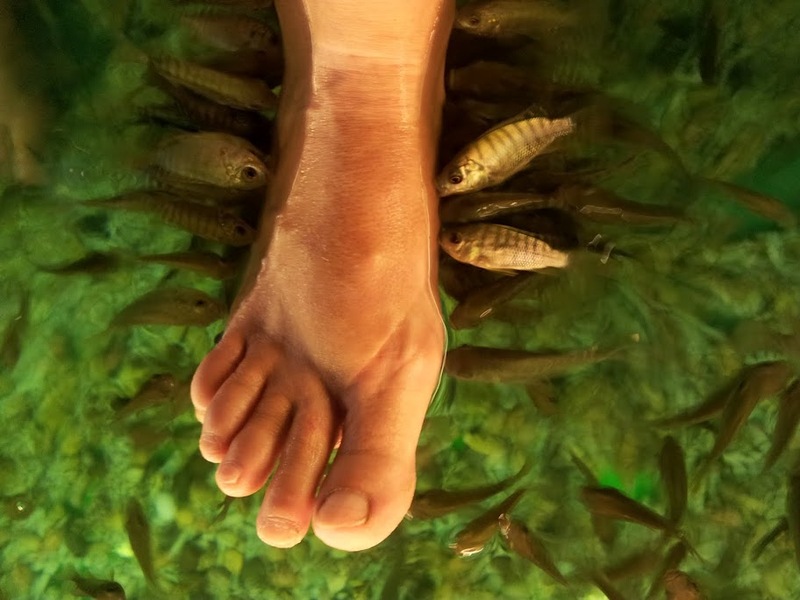 In Vietnam, Bill and Hank had special treatment. 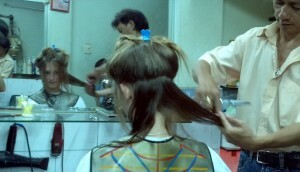 In Ho Chi Minh City the hair salons employ men to cut the hair. But women do a lot of work there. 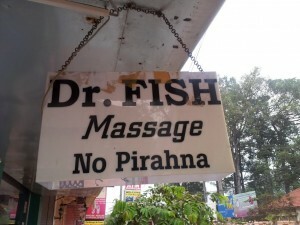 They provide the nail care, the massages, and the enticement. Dressed in matching, sequined, and colorful dresses five or six women invite customers into the salon. Bill sat down in the barber chair and was given a “menu” of choices for hair care by a young, buxom Vietnamese woman. We convince Hank to join him for a haircut while Cat and I spent the hour on a couch giggling and “conversing” with these women. Despite all the cleavage parading in front of my husband and son this haircut was relatively risk free. 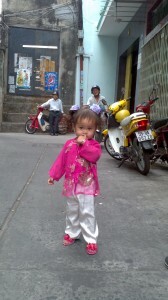 Cat also got her haircut in Ho Chi Minh City, her only one of the year. We were exploring alleys of the city the day after the boys had their haircuts. As the alleys are only wide enough for pedestrians, the city calms down in them. No motorcycles weaving around us or small trucks honking their path clear, we were able to walk slowly and look into the shops. We came across a hair salon with a young woman seated inside. We pantomimed a haircut. We thought she agreed, but she abandoned us, quickly running out of the shop. But in time she brought a young man back with her. The stylist. Cat sat down in the chair, he wrapped the cape around her shoulders, pinned the top layer of hair on top of her head, and started cutting. With a straight blade. I audibly gasped. He was shaving her hair not cutting it. Here was trouble. Cat is going to kill me, I thought. This just isn’t going to work. But slowly the layers were created, and the random long hairs were trimmed, the edges evened up. When her hair dried in the hot, humid air of Vietnam she had curls and a bounce she’d never had before. She had a beautiful haircut. Hank experienced the razor one more time, this time in Bali. It was a medical necessity to shave the hair from his scalp before the doctor stitched the gash on his forehead. A surfboard had hit him in the head, splitting his skin. Really, this was the most serious thing that happened to us on the whole trip. 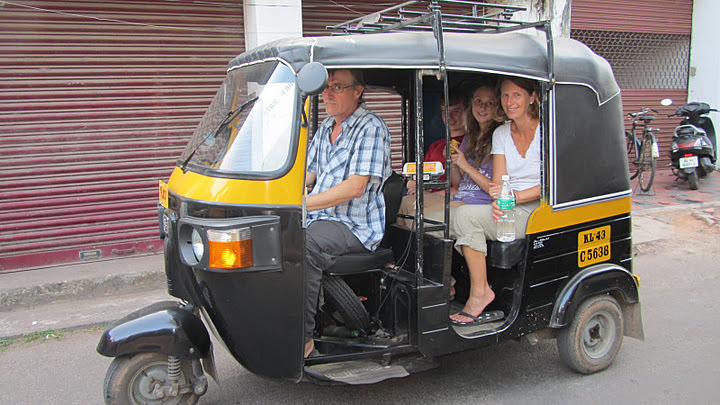 No car crashes despite the driving in India. No muggings despite the crime in Nairobi. No shootings despite the drug wars in Mexico. To tell you the truth, I don’t think it was because of good luck. I think that the dangers in travel are just not as common as we (including that guy I met in the salon before we left) perceive them to be. It may be more dangerous driving the freeways of California every day than spending a year traveling around the world. The third world isn’t the only dangerous place. We live in Oakland, one of the top 20 most dangerous cities in the US. We chose to face the danger of living in the world abroad rather than at home for a year. Granted, we did experience plenty of difficulties on our adventure. Luckily we only needed to wait a couple of weeks each time for things to get better. It just doesn’t take all that long for hair to grow back. We’ve been home a little over a month now. We traveled for a whole year. 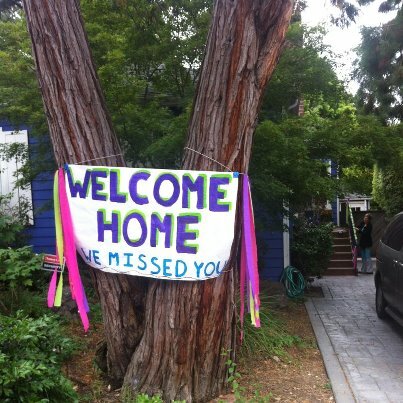 We left July 1, 2011 and came home July 1, 2012. A leap year, 366 days. I expected some culture shock when we returned. But instead we just flowed into life here. We’ve lived in the same neighborhood for 18 years, the same house for 14 years. I’ve had the same job for 13 years. Everything was as we left it. It was all so normal. Granted, drinking from a drinking fountain was strange, and I caught myself about to throw the toilet paper in the bin instead of the toilet. But those were little things. The house smelled the same when we walked in. 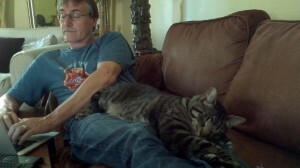 The cat fell asleep on Bill’s lap. I slept deeply in my own bed. The hardest part now is not that we’re home but rather we’re not on the trip. It’s over. It’s no longer blowing in my face, blowing my hair in every direction. I’m no longer surrounded by it. It’s off to the side. My backpack is in the basement. The trip now just a package in my life. A group of memories to pull out and turn around in my hands, maybe compare a couple of memories to make some sense of the experiences, but no longer to be in the experience. There was the night I sang Hotel California to a karaoke machine at a hotel’s Christmas party in Bangkok. There was a Christmas tree with gifts. We played games with chopsticks for prizes. I still have the ID tag on my backpack that I got that night. In the markets in Chiang Mai there were the blind kids led by their mothers singing to a karaoke machine. Their voices were clear although their eyes weren’t. We dropped bhat in their buckets. Their singing was so much better than mine. 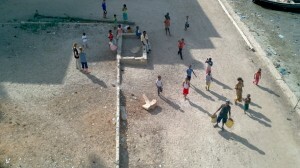 We watched nine year old girl, Sanaa, play outside of our window in Lamu. She had a goose egg on her forehead from a beating by her older brother. She sat down next to me and slowly read a book out loud, a book she had borrowed from school. She couldn’t go to school everyday. She had to take care of her baby brother. We later met another Sanaa in Mexico. She was from a more privileged background in Cairo. She showed us where to learn to salsa in Guanajuato. As she was dancing she locked onto her teacher’s eyes. Both Bill and I knew she’ll never leave Mexico. 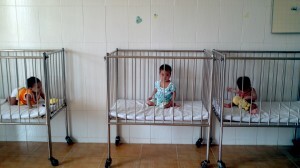 In an orphanage in Viet Nam there were babies with disabilities we never see in the States. Children here have surgery before they get so ill. Underneath the first shirt I lifted for an exam was skin covered with the red dots of scabies. In Indonesia I was stung by jelly fish. We swam through schools of tiny jelly fish that got caught in my bathing suit top and red dots spread across my chest. But really these dots were scabies bites showing up five weeks after we visited the orphanage. We found medicine in Singapore once I figured that out. There was the pair of glasses I bought in India. I’d broken my pair I brought from the States. At Vishal Opticals in Haridwar I got glasses made in less than an hour for $20. Weeks later while riding in a taxi in New Delhi, I looked at the moon. There were two. They were beautiful. 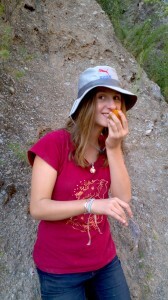 I quickly learned not to wear the glasses hiking. I couldn’t tell where my feet would land. At passport control in Qatar the officer wore a white robe with a white veil over his head held in place by a checkered black and white ring. He was beautiful in his Arabian clothes. He looked at the picture in Hank’s passport then looked at Hank. He did a double take and said, “You were fat then.” Hank blushed while we all laughed. To get from Cambodia to Viet Nam we took a boat down the Mekong. 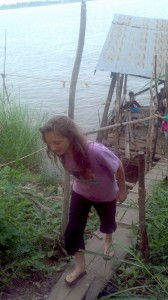 The boat stopped at a small dock with a steep, rickety bamboo walkway up to passport control. We were met by immigration officers and chickens. Now that we’re home all our friends are asking one common question: Where was your favorite place? It’s an impossible question to answer with one single country. Favorite for what? The best food was in Mexico, or maybe it was Turkey. The most beautiful scenery was in Nepal. But then again the beaches of southern India were perfect with coconut palms and warm waves. And what could compare to waking up and looking out over the rice patties of Bali? The history was most layered in Turkey or maybe it was India. 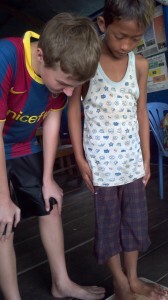 The sweetest people were found in a slum in Nairobi although the smiles in Siem Reap came so easily and so warmly. Cambodia had the best pace, India the worst. Each place had its own superlative or even several superlatives. Oakland has its own superlatives, too. The food is phenomenally delicious. At a friend’s house we ate farro with feta and killer chicken with leeks. 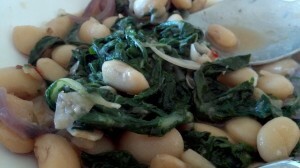 At a restaurant I ate chard with butter beans seasoned with garlic, lemon zest, and red chili. I savored each bite so slowly. I’m so happy to be eating California vegetables again. We went to an A’s game against the Red Sox a couple days after arriving home. I tried to look at it as a tourist would. Then the A’s won, and I was a native again. 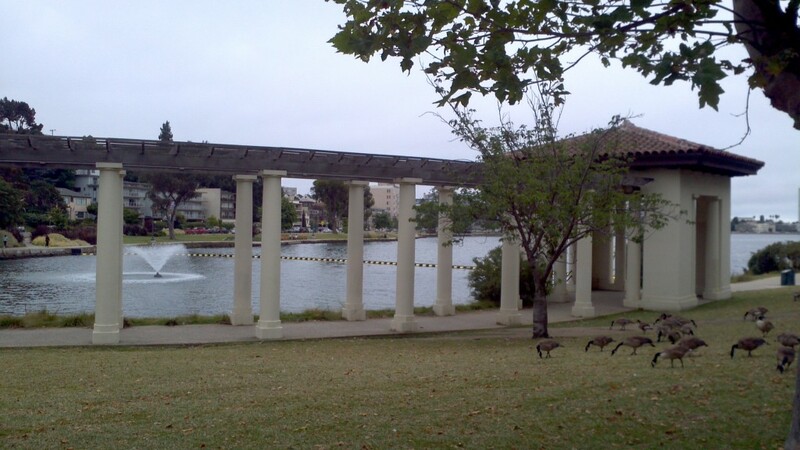 On my way to work I’ve ridden past Lake Merritt, covered with egrets, cormorants, and pelicans. I’ve tried to soak it up as if I’ve never seen it before letting the chill of the Oakland summer fog cement the experience to my bones. Because now I have the eyes of a traveler. I want this year-long trip around the world to continue to blow my hair in my face. Even if it’s not in a new destination, even if it’s at home. I want to bring that package of memories back from beside me and put it right back in front of me. I want to fill it with more experiences and even more memories to pull out, examine, compare, and enjoy. I spent some of my time this last year doubting myself. Was this trip the right thing to do? What about the kids and their education? What about the money? Am I getting everything I want out of it? Are we missing opportunities along the way? Everyone we talked to wanted to help us worry about our money and our kids. We fielded a lot of questions about these things. The most common question we encountered was, “You can take your kids out of school?” Apparently, it’s impossible in some countries like Germany and unheard of in most countries. We explained our philosophy of increasing our kids knowledge through experiences out in the world rather than in the classroom. We weren’t too worried. I was more concerned about doing this trip right. I had read a lot of other travelers’ blogs. Many travelers packed so much in, barely resting, really seeing a lot of the sites in the world. So I had doubts about the choice to travel slowly, planting ourselves in a situation in one place for a month at a time. 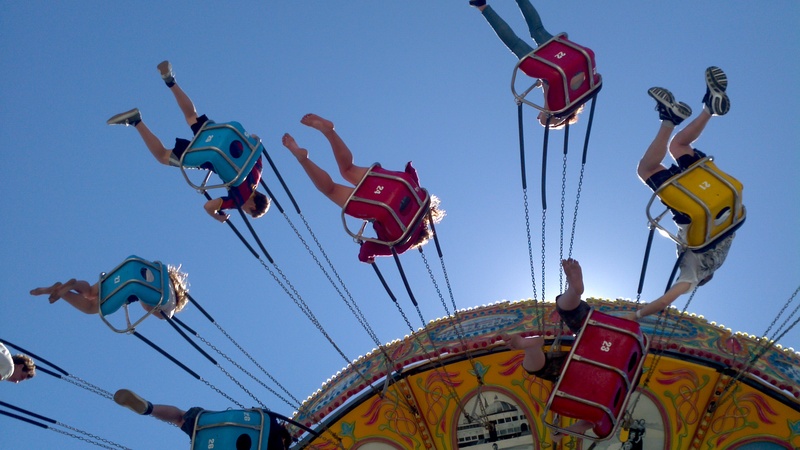 There were plenty of days without any adventure, some days without anything. Were we missing important experiences? 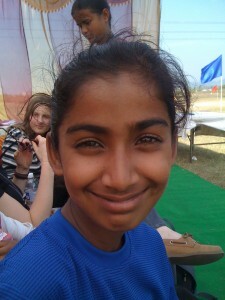 But then I remember the day we went to the field hockey tournament in India. We had this opportunity only because we stayed in one place for so long and got close the people there. 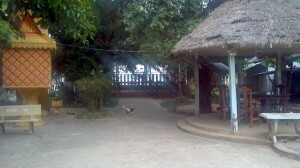 We were staying at an ashram that supports a school of about 500 kids, most of them from the surrounding villages. 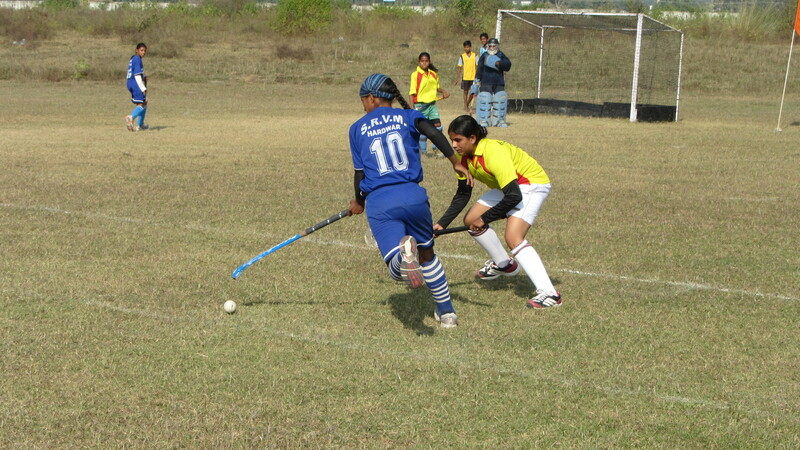 The school has a boys field hockey team and a girls field hockey team. Both teams are very good. The girls team won regionals last year and went to nationals. 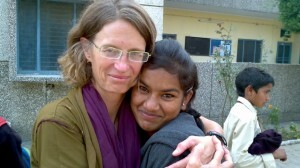 It was made up mostly of girls from the ashram with two or three additional girls from the village. 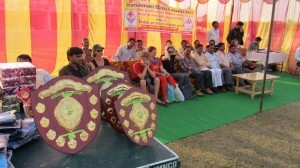 We were staying at the ashram when there was a local tournament with three or four other teams. Six of us visitors insisted on going along so we could cheer the girls on. We thought they could use some American style cheerleaders. We rode the school bus with them to the field about 45 minutes away. The girls, the coach, and their equipment. They were all getting ready for the game. Except one of my favorite girl’s. She probably has ADHD. She lives her life a bit flaky. She forgot her shin guards, socks, and hockey stick. The coach wouldn’t let her borrow equipment. 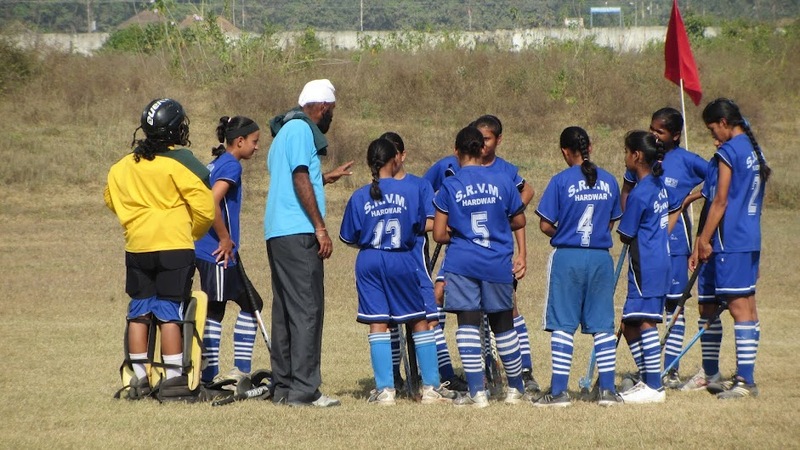 She couldn’t play, and the team was left with only one substitute. When we got to the field the other teams were there already. We, the visitors, were escorted to a fancy red and yellow striped tent that looked out over the field. It was the only shade on the entire field, a place for the VIP’s. As soon as we got there everyone wanted to be near us. We were placed on the couch in the center of the shelter. We had our pictures taken with what seemed to be each and every visitor and player in every possible combination. We were bombarded with questions. “Where are you from?” “Why are you here?” “Do you know my uncle in California?” It was not only the relatives in the tent who wanted to talk to us but the athletes as well. One pretty girl was pushed forward by her teammates because hers was the best English in the group. Still, all she could say was, “Where are you from?” She couldn’t understand the question, “How old are you?” It made me realize an advantage the kids at the ashram have practicing English with the visitors every day. 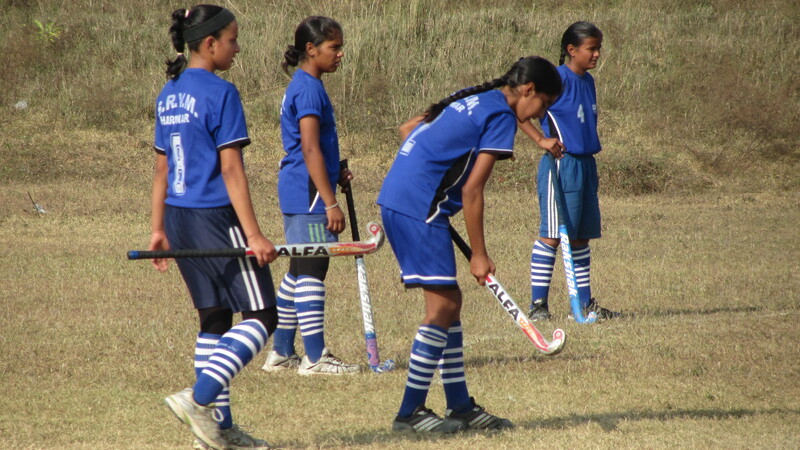 Another disadvantage of some of the girls was reflected in their uniforms. One of the teams was dressed in their salwar kameez. Colorful long tunics, baggy pants, and each with a dupatta or scarf. Everyone wore the scarf. On some it was tied around their waists. On others it was tied across their shoulders like a sash. One even had it pinned to her shoulders. 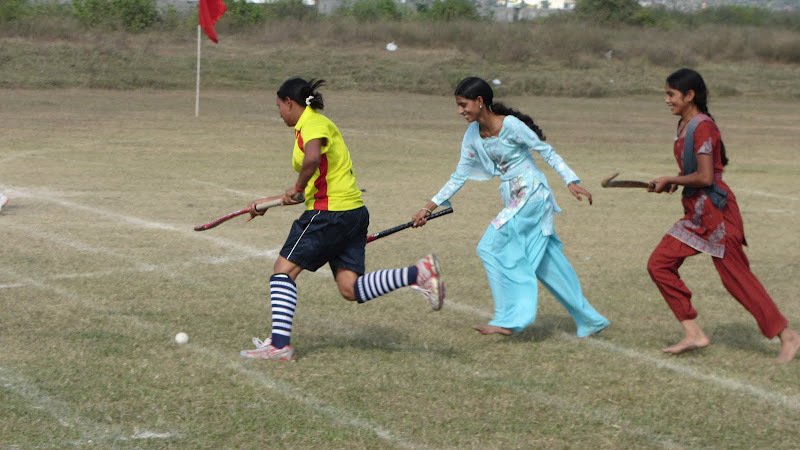 As the girls were swinging their hockey sticks the dupattas were waving in the wind. They didn’t have the athletic gear of the other teams. No sweat pants or team jerseys. Not even shoes. I was told they couldn’t afford it. They didn’t have the skills either, but they were determined to play. And they sure looked beautiful while running in their colorful suits. We yelled and cheered and jumped at the side line as our team won one game and lost one game. The team they lost to was an all star team from teams around the region. The refs were former coaches of those girls. We couldn’t help but feel that our kids were being cheated. We could see the bad calls made by the refs. 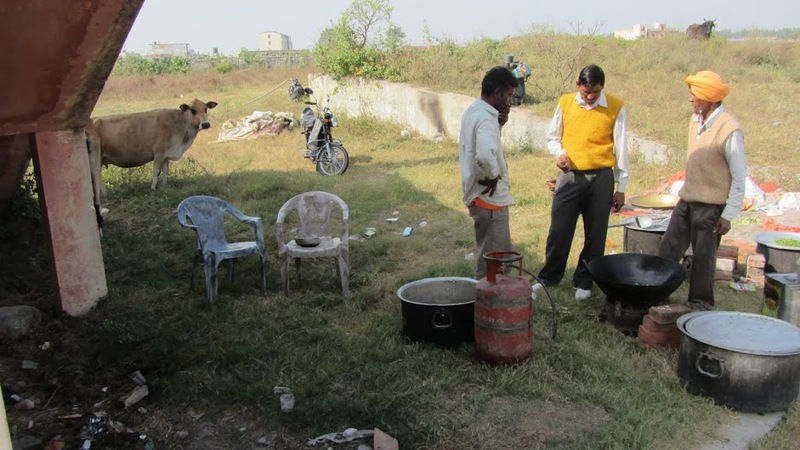 The girls told us they were used to these circumstances in India. With at least 1.2 billion people in India, there’s a lot of competition to get to the top. It’s not always right, and it’s not always fair. The tournament was just a small example. After the girls played it was time for lunch. During the entire tournament, three men had sat by the side of the field with large pots over blazing fires. They were chopping, stirring, and frying. Feeding the players and the fans was all part of the tournament. We ate a mixed vegetable curry, spicy chickpeas, and deep fried flat bread. The food was delicious, and it was spicy. We needed water. What little we had brought was drunk by everyone sitting in the tent with us when we turned our backs. This was the community of India after all. The cooks offered us tap water to cool the pain. We politely said no. We’d already had enough experience with Indian tap water. The food was delicious, but the water was scary. After we ate lunch we gathered again in the tent for the award ceremony. 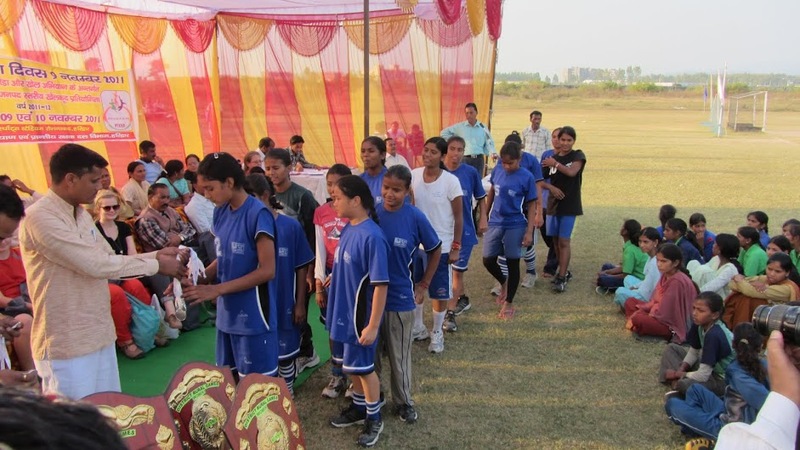 The officials presented each of the teams with a plaque, and each of the girls with a medal and a t-shirt. The coaches were called to the podium to receive their presents of sweets. Then Catherine’s name was called. We didn’t hear it. There was no reason for them to have said Catherine. But her name was repeated. Then came the names Bill and Hank and Annie. And our friends Caitlyn and Julie. We each went to the podium and received a flat, square box wrapped in shiny wrapping paper. What was in it? And why were we getting gifts? When we opened the packages we continued asking why. We had each received a very cheap and very kitschy wall clock. They were, of course, plastic, and each had a badly colored, trite photo behind the ticking hands. One had a picture of puppies on it. Another had a waterfall. They were ugly. But someone had gone out during the tournament to purchase and wrap presents for us, the Europeans, the guests of honor. Wall clocks. We never found out why wall clocks. They weren’t going to fit in our backpacks. We didn’t really want them anyway. We decided to leave them all at the ashram. The kids there will have something to remember us by when they’re rushing to get ready for school. And we’ll certainly never forget those kids. Or the tournament. Or the wall clocks. Quirky, unique memories. Memories formed by moving slowly through our travels. Wonderful memories. No doubt. We eat a lot of Mexican food in California. Whether just a snack of tortilla chips and salsa or our Christmas Eve meal of tamales this cuisine is an important part of our lives. It was hard living without it. We tried Mexican food in Rishikesh, India. Twenty-four hours later we all got violently ill. We went to a Mexican restaurant in Buenos Aires. Overpriced and mediocre with incredibly weird beans. We ate tacos in Chiang Mai, Thailand. A Canadian owned the restaurant. It was the best of the year. Until we got to Mexico. 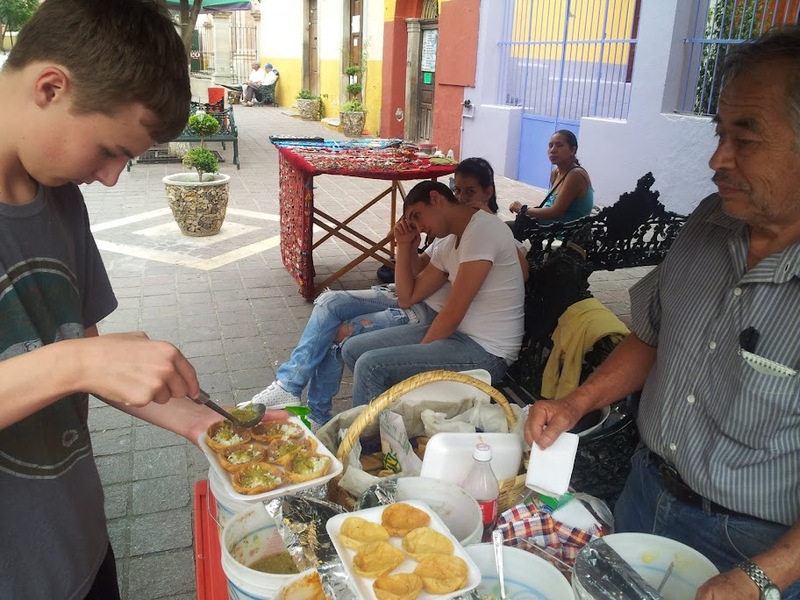 Some of the best eating in Mexico was on the streets. We had been so careful in other countries with street food, and despite being careful we had been sick in almost every country. But there was no way we were going to miss out of the flavors of Mexico. And the flavors live in the street. At taco stands or puestas, at fruit stalls and chip stands, at stands selling fruit drinks or agua frescas, at ice cream carts and pots full of tamales. We found our joy so easily. Of course, we each got sick in Mexico. We never knew which food had made us sick. It was usually too hard to figure out. And it didn’t matter. We just wanted to taste the essence of Mexico. And we found it on the street. The most important flavor in Mexico is corn. The ancient Mexicans figured out how to process it. Once the corn is ground it’s mixed with water and sometimes lard to make a dough or masa. There are so many shapes into which masa is formed. These shapes then hold all sorts of good tasting foods. 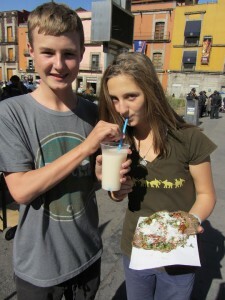 In Mexico City, in the Zocalo, the original plaza of the Aztecs, we tried a tlayuda. It started with a large thin crisp of blue corn, rendering a crisp yet slightly chewy base. 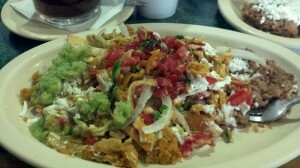 It was then smeared with refried beans and sprinkled with roasted cactus leaves, hot sauce, and cheese. 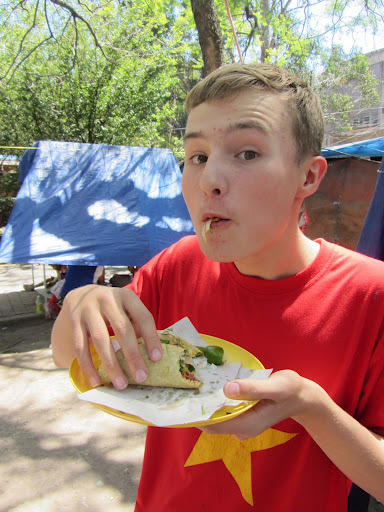 In Guanajuato we discovered the chalupa or “canoe”. The yellow corn masa is formed into the shape of a small boat and then deep fried. It is the crispy, slightly greasy vehicle for beans, cabbage, cheese, and, of course, the red or green salsa of your choice. The mix of textures were perfect: the chalupa was so crisp it would crackle as I bit it, the beans were a soft interlude, and the cabbage provided a crunch. The salsa invariably ran down my arm as the chalupa fell apart on the first bite. 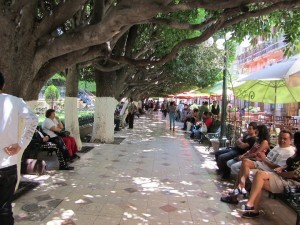 In Guanajuato we headed to El Jardín de Embajadoras, a plaza known for its tlacoyos. The masa is shaped into a pointed oval as it’s folded around a filling of meat or beans or cheese. Then the package is cooked on the skillet or comal. Of course, there is a variety of spicy salsas waiting on the counter to pour over the tlacoyo and to enhance the combination of bean and corn. We would often choose a salsa verde as it seemed to compliment the pork we kept ordering. 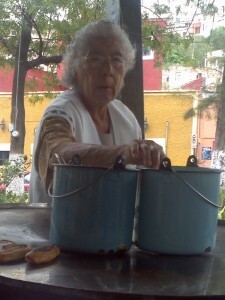 In the Plaza Baratillo there were a score of puestas selling food over the course of the day. During the day most sold tacos and/or gorditos. 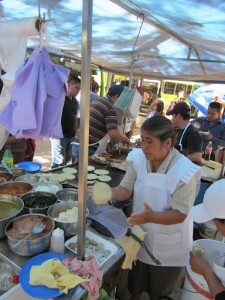 Often the tortilla was handmade, a ball of soft masa is pressed flat in a tortilla press then thrown on the comal to cook. There are a dozen or so tins of guisados or stews. My favorite always involved pork often in a red chili sauce. I never tried the tripe. Cat, our vegetarian, would break with her strict diet accepting the lard that enriched the beans. 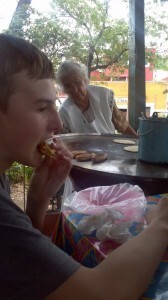 In contrast to the tacos gorditas were made by not pressing the ball of masa quite so thin. The dough would puff like pita bread. The women running the puesta would slice open the pocket and fill it with the guisado of our choice. The gordita had a heftier masa bite than the tortilla. I preferred the gordita, Bill and Hank the tacos. Our favorite stand of Plaza Baratillo was one that didn’t start its operation until after 6pm. They didn’t serve beans. Only tacos with meat. 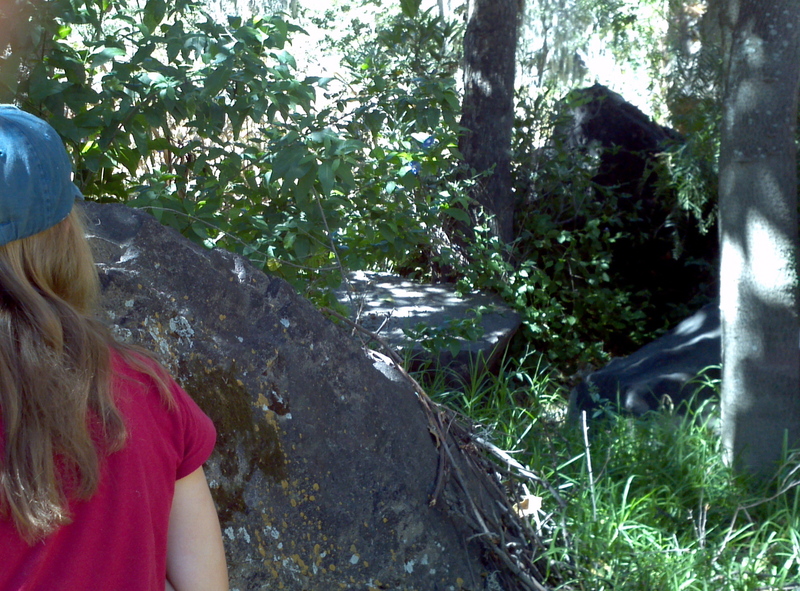 During our last week in Guanajuato (and of our year) Cat got the flu. Bill, Hank, and I left her at home and headed to the stand for dinner, three nights in a row. The men who ran the stand didn’t make their own tortillas. They made their tacos with two tiny tortillas like the ones at taco trucks in Oakland. They had chopped the meat before grilling it on the skillet. 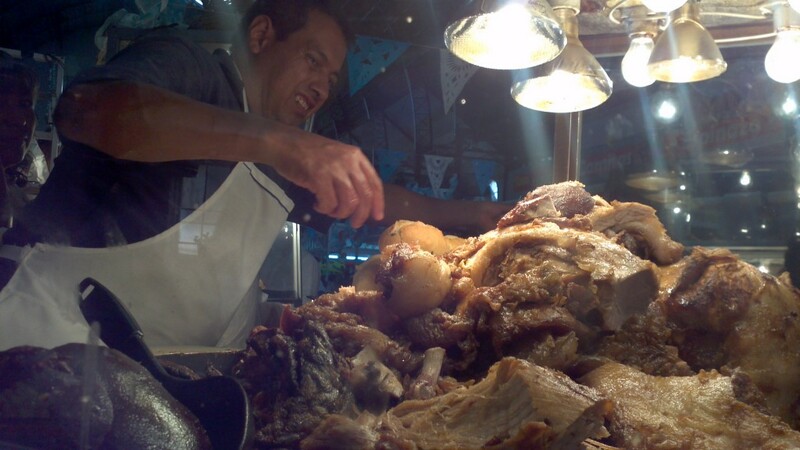 As the meat cooked lard was rendered into a groove around the comal. They dipped the tortillas in the lard before heating them. Then filled the tortillas with meat of our choice (carnitas, chorizo, chicken, or al pastor) and added grilled onions, cilantro, and fresh onions. We chose from the salsa bar either salsa roja, salsa verde, or avocado salsa. If I forced it I could eat three tacos. Hank, one evening, ate seven. 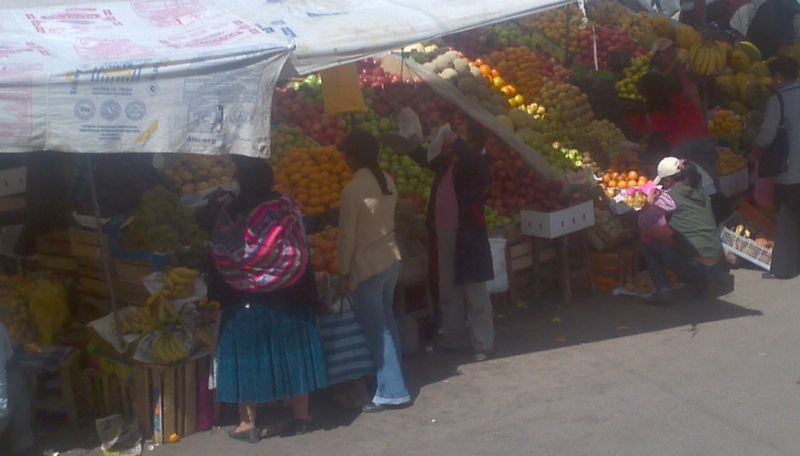 In the Mercado Hildago the vendors sell food. There stalls selling fresh fruits like strawberries, mangos, and rambutan, vegetables like cactus leaves and chayote, milk, cheese, and meat. And then there are the restaurant stalls. We walked past the tostados with seafood, I drooling, the rest of my family not at all interested. 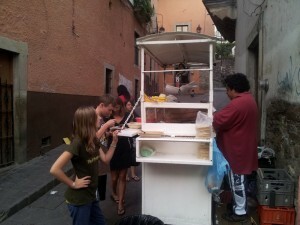 Then we found the carnitas stand. Cat still was not interested, but the rest of us paused. The vendors stood with large chunks of pork in their hands, ready to hand out their samples. I took one and bit in. The intensity of the flavor and the tenderness of the bite was wonderful. We watched Hank as he ordered a taco, doused it with salsa and headed toward gustatory bliss. Bill and I had just eaten lunch and could only dream of how wonderful the taco would be if we were hungry. Guanajuato wasn’t hot while we were there, but we had a lot walking to do there. Much of the city was closed to cars; the automobile traffic was in tunnels made from old riverbeds. Many of the roads were really just footpaths heading up the ridges to get to another part of town. We were often thirsty. We drank agua fresca. We decided to trust the ice. The family’s favorite flavor was orchata, a cold drink of rice, cinnamon, and sugar. We tried the strawberry, but it often tasted artificial. The watermelon was real and devine. Cut fruit was also available, the classic way to eat it is with a shake of salt, a sprinkle of chili, and a squeeze of lime. We usually ate the mango, but also liked cucumber and jicama (not a fruit). 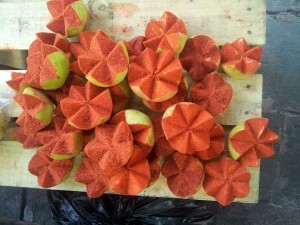 We didn’t try the pears sold on the street, jagged cut and covered in chili. 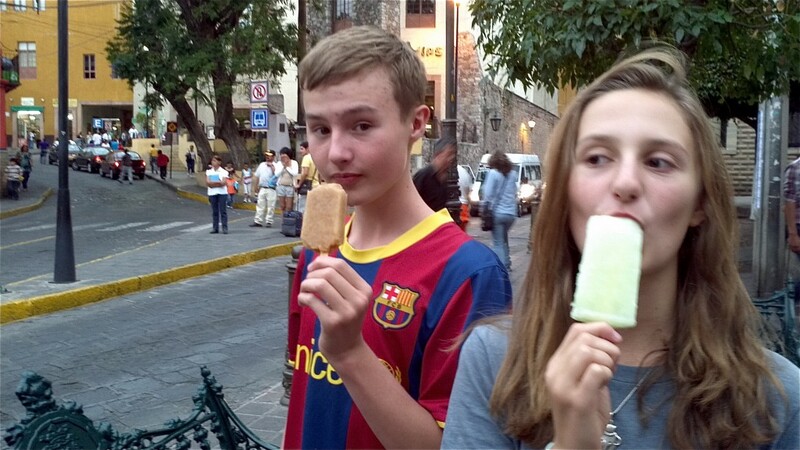 Along with the aguas frescas we quenched our thirst with paletas or popsicles. As we headed to the vendor I was sure I was going to make a big leap in adventure. There were so many flavors: lime, coconut, strawberry, strawberry with cream, pistachio, mango, mango with chili. But I always chose tamarindo. It always had the right sweet-sour balance to make my mouth pucker as it melted and left my tongue with a sweet after taste. 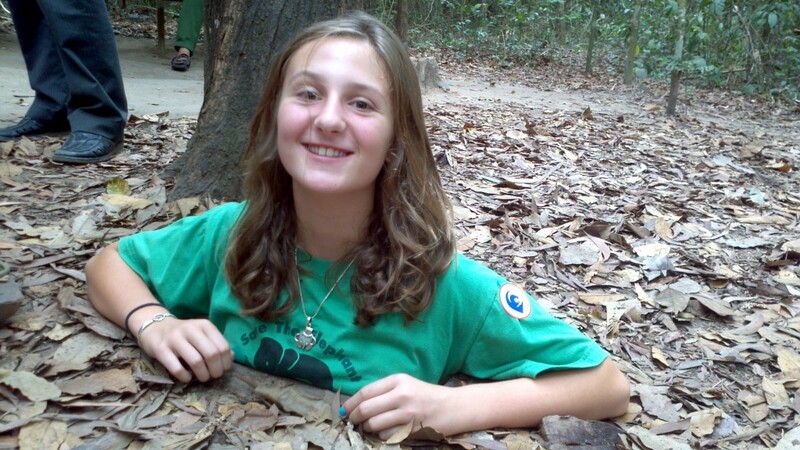 My kids were more adventuresome. They are still working on which is their favorites. Ice cream was also a cold treat we favored on the streets. 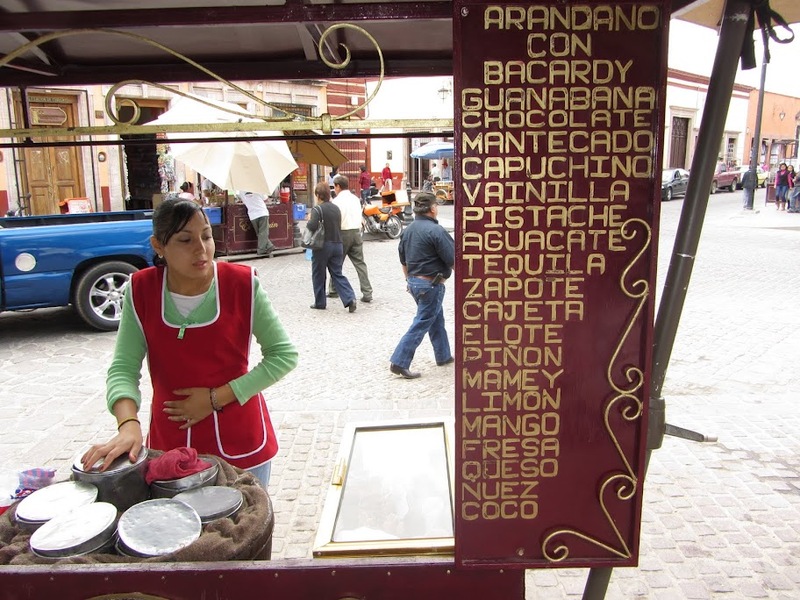 We were told Dolores Hidalgo was a small city most famous for its ice cream. The ice cream was made in tubs and sold from the tubs. Push carts filled with ice and tubs of ice cream fended for a spot at street corners, as many as five on one corner. The flavors were numerous. There were the classic flavors: strawberry, vanilla, chocolate. There were the slightly more daring flavors: mango, caramel, and coconut. And then there are those we had never seen before: tequila, cheese, avocado, and corn. 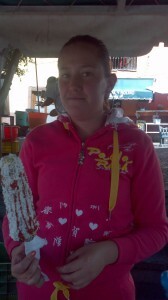 I never found it, but apparently some vendors were pushing octopus ice cream through the streets. We weren’t able to sample many of the snacks on the streets. We were never hungry enough to try everything we saw. I did try the roasted corn on the cob slathered in lime-flavored mayo, cheese, and chili sauce. I took three bites and threw it away. It was rich, chewy, and just plain awful. I wanted to try the potato chips with chili sauce poured over them or the Doritos, the bag slit open down the side, with chili and chewy chicharrones poured inside. There were fruits blended whole and poured into cups. Pastries in huge baskets tended by old women tempted me, but I had already indulged in the tacos before I could get to the others. 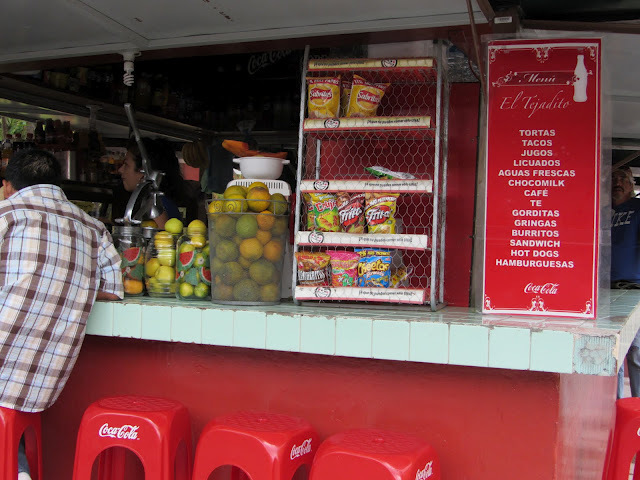 The choices on the streets of Mexico were endless, and we couldn’t sample them all. I guess we’ll have to go back. 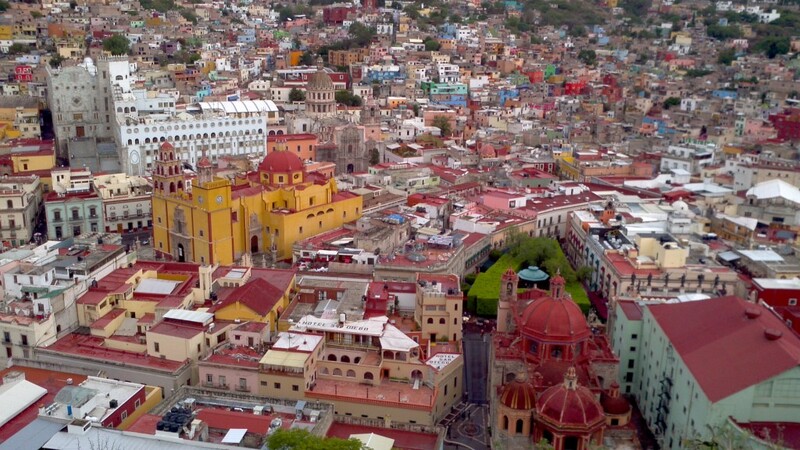 We spent our last month in Guanajuato, Mexico, up in the mountains north of Mexico City. The city is built in the 1500’s within the ravines of a few connecting dry riverbeds. We lived toward the top of a ridge above most of the town. Sounds were carried up into our home bouncing off the walls of ravines. And we heard the music of Mexico, music which didn’t stop. Truly, it didn’t stop. In the central garden, El Jardín de la Unión, by four o’clock in the afternoon there were three or four groups of mariachis waiting to serenade a table. In the evening there were sometimes as many as nine groups. 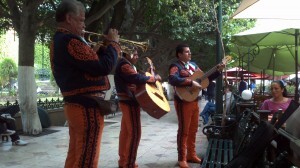 Mariachis are an important part of celebrations in Mexico. Tables of people celebrating often a birthday, but sometimes a reunion, or a football match victory would hire a band to sing six or seven songs. Often there would be two or three bands singing around different tables at the same time. They would sometimes wait for each other to finish a song, but sometimes they’d play at the same time just like stereo wars in a college dorm. Some mariachis were dressed in jeans and cowboy shirts, sporting Stetsons on their head. But the look I liked was the classic mariachi suit: a short waisted jacket above high waisted pants. Cowboy boots are de rigueur. The pants were trimmed with metal links up the outside of the legs. One mariachi’s pants were trimmed with tiny spurs running up his legs. For another the links held small skulls together from his cuff to his waist. One band had several different suits, different colors on different days of the weeks with cowboy boots to match. The most striking was the orange suit with bright orange boots. The music of the mariachi is classic Mexican. Some bands had a number of violins, some added one or two trumpets, and some had a drum set. They all had a couple of guitars and, of course, that big bass guitar with the curved back so needed for the bass line of the Mexican songs. They sang in baritone and tenor, somtimes in harmony and often off-key. The mariachis played every night usually until 5 in the morning, their songs drifting up the ravines into our bedroom window. Late in the evenings estudiatinas join in the music making. 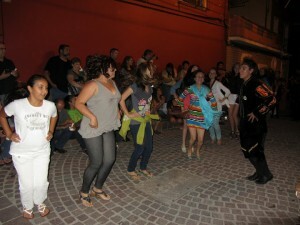 This tradition began in the early 60’s when some students discovered the music and traditions of medivel Spain. 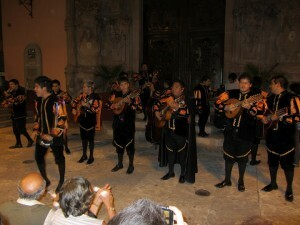 Groups of student musicians dressed in medivel European outfits play songs and lead tourists through the narrow alleys of Guanajuato. The experience is called a callejoneada, translated as something like alley-ing. The songs were mostly well known Mexican songs. Everyone around us was singing along. 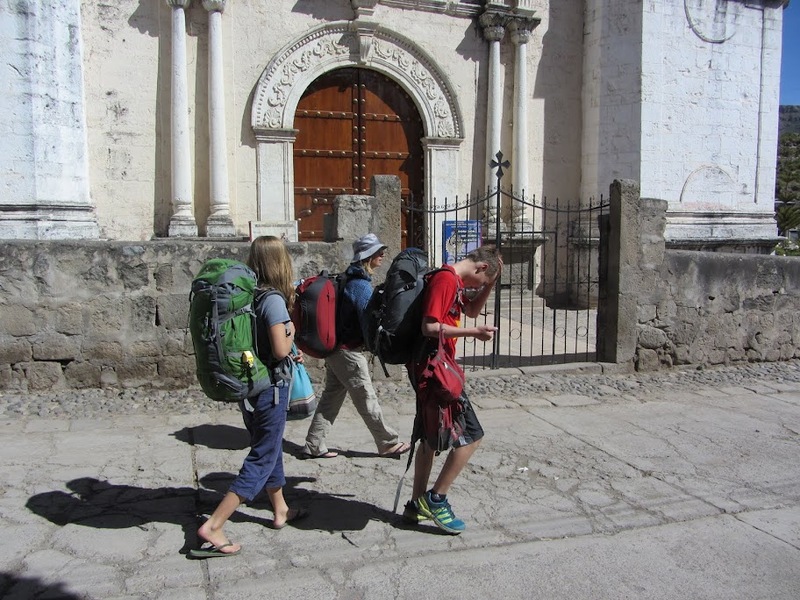 The estudiatinas would stop and tell a story in various plazas throughout the route. In one plaza we were taught to drink from a porrón, a Spanish wine decantor. We had learned from our friends in Spain a couple of years ago. I thought I knew how to do it but ended up spilling apple juice down my front. Hank didn’t spill a drop. The estudiantes then led us to yet another plaza and pulled Cat out of the crowd to dance along with several other women. They played a song about a rooster, and my daughter had to flap her elbows like a chicken. We didn’t understand the words of the song, but we laughed out loud. 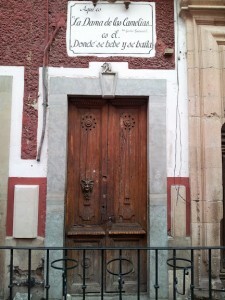 The tour ended at the Callejón del Beso, or the Alley of the Kiss. Bill and I kissed in the alley, guaranteeing us years more of wedded bliss. Dancing is part of the music. 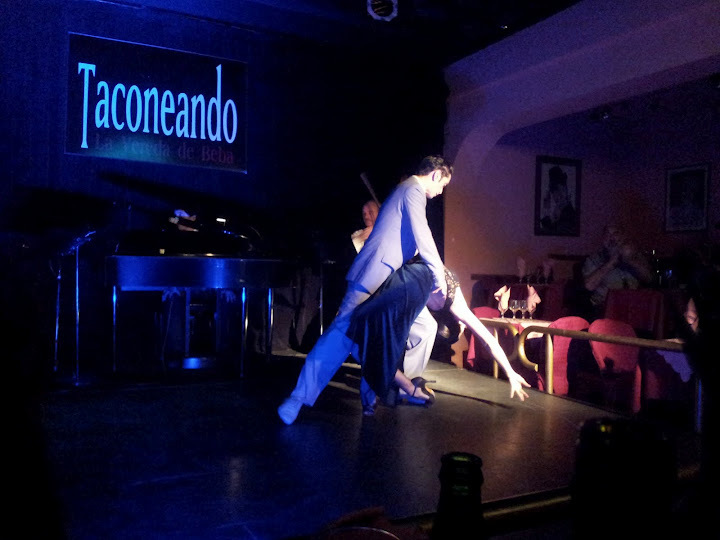 Salsa music reigns in a couple of bars in Guanajuato. There the atmosphere is mellow. 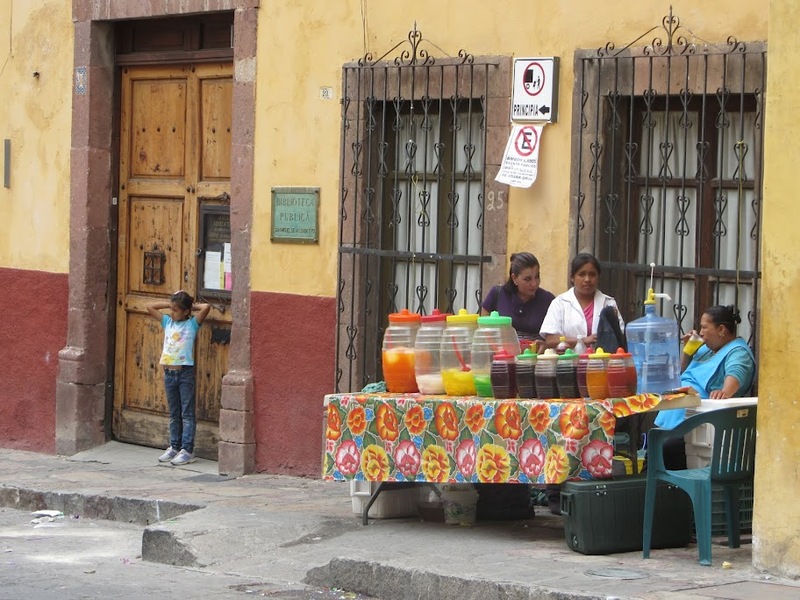 Many of the people in Guanajuato really know what they’re doing. Their feet follow the rhythm: 1-2-3…5-6-7 with smooth, subtle steps. Their hips follow the rhythm as well but in a much wider path. The women dance better in heels, but no one is dressed to the nines. Bill and I tried to learn, taking a couple of lessons. It didn’t work. We did enjoy sitting at the tables, watching the dancers, swaying with the music, and drinking our palomas. The salsa music wasn’t just for the bars. 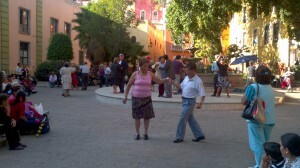 On Fridays a group of seniors gathered to dance at the Jardin Reforma. The music was recorded but the DJ was live. We watched as maybe 10 couples all over 70 years graced the plaza with their dance steps. Some of the men still had it, leading their ladies, hopping, skipping, and sliding. At the end of the songs the DJ encouraged us onlookers to applaud for the dancers. I clapped enthusiastically. We also got to see two symphony concerts. 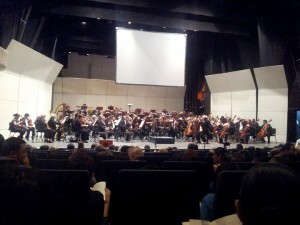 The university symphony plays every Friday night. The kids and I went to see a group of musicians playing music from the renaissance. A street musician moved in down the road from us and played the same Beatles songs on the street every day with his guitar case begging for pesos. Cat and I had drinks (only mine had tequila) at a bar just to listen to the band. Bill and I even visited the disco recommended by our flaming, round, works-at-night-as-a-lawyer Spanish teacher. But there was no music there. Just a bass line with 20-somethings dressed to kill and barely tapping their toes. The songs that were blaring were just noise as a backdrop to the pickup scene. 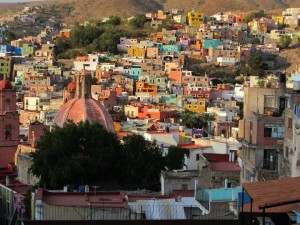 And noise is part of the Guanajuato experience. In the mornings the roosters crow and dogs bark. 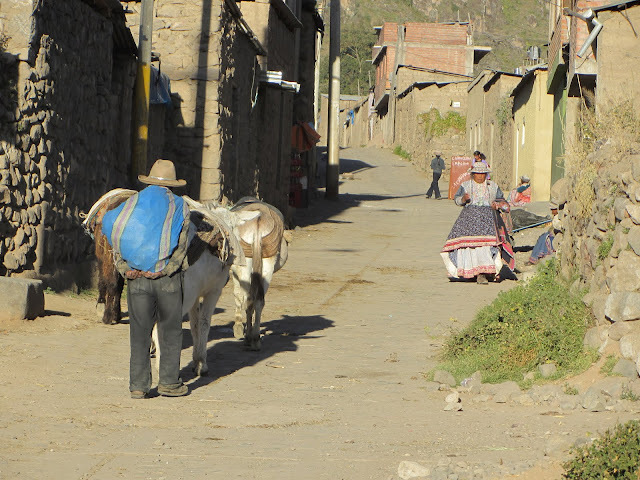 Strong men who carry water jugs or gas tanks yell out their wares, “Agua” or “Gas”, throughout the day. But it’s the music that is the noise that makes the town special. There was music day and night, though mostly at night, all night. The music would sometimes wake me up. 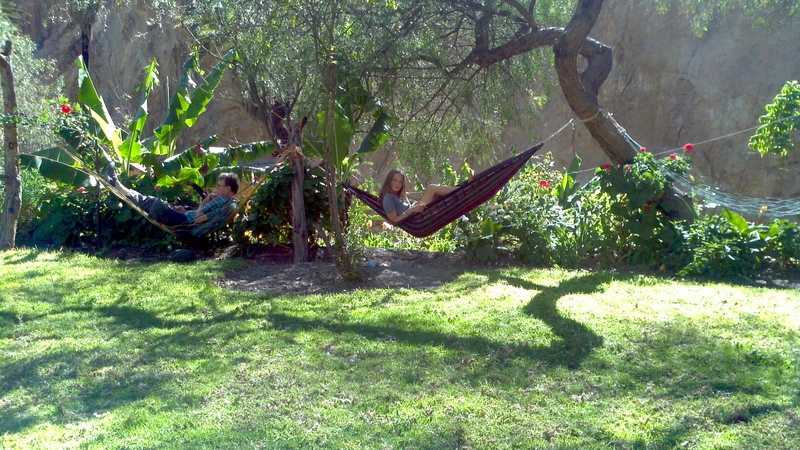 And I would smile as I drifted back to sleep, serenaded by the music of Mexico. Thank God I couldn’t hear the disco. In our travels this year we’ve been to three museums with mummies. In Istanbul, there is a classic Egyptian mummy, King Tabnit, on display. He’s displayed next to Alexander the Great’s sarcophagus. 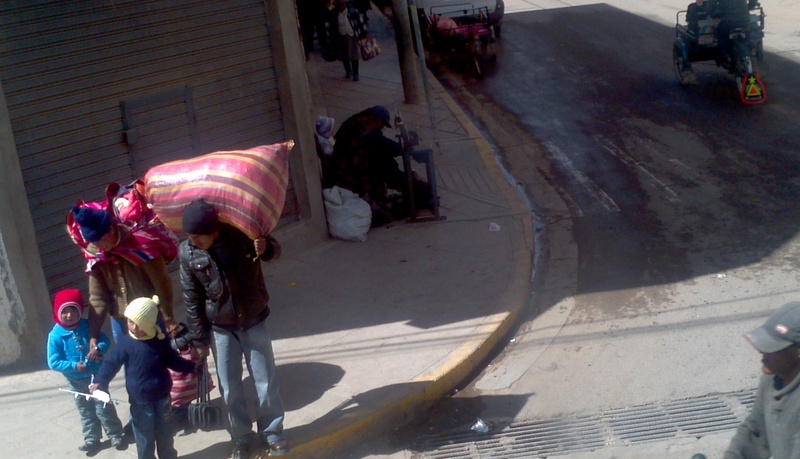 In Arequipa, Peru, we saw a frozen mummy named Juanita, who was sacrificed on top of a 6300 meter mountain, Mt Ampato. She was basically freeze-dried and is now displayed in a glass-walled freezer. In Guanajuato, Mexico, we visited the Museo de las Momias. Here instead of one mummy, there are scores of mummies, literally halls of dead bodies, mummified not by intent but by a natural phenomenon. Warning: Below is a picture of one of the mummies. If you’re squeamish, don’t continue. I’ve read of two theories of how the mummies came to be. In the first theory , some of the bodies of the dead were placed in crypts above ground since the 1700’s. The worms couldn’t get into the crypts to crawl in and crawl out, and there was no moisture in the air. So the bodies just dried out, completely. On the other hand some of the locals say that the soil is of a special composition of minerals and that some those bodies which were buried were mummified through a chemical reaction with those minerals. The mummies were first discovered when in the mid-1800’s a tax was placed on families for the upkeep of the cemetery. If the family couldn’t afford the tax, or if there was no family, the body was exhumed. To the surprise of the officials they exhumed mummies. 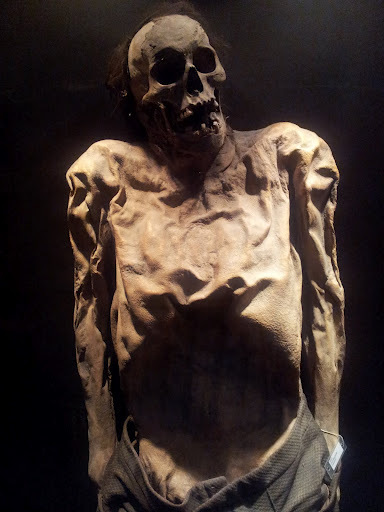 Most of the mummies are in amazing condition with their dry, papery skin still intact. Many are wearing their shoes and socks. Some still have on some article of clothing. One man is wearing a pair of polyester pants which look as good as new. Most are, however, naked, many fully intact though shrunken. There are people from all walks of life. The first mummy exhumed was a foreign doctor. One mummy has a huge wound over his liver where he was stabbed. Another mummy has her arms over her face as if she struggled within her tomb. It is believed she was buried alive while in a state of catalepsy. Babies are buried in their christening gowns. A mother was buried holding her premature infant. A tiny embryo was discovered mummified within a crypt, the mother’s body having disintegrated around it. For a really ghoulish display, a side museum keeps the mummified body of a “vampire”, a body with two very long pointed canine teeth in its mouth and a wooden stake through its heart. Somehow it fits that these mummies were discovered and are displayed in Mexico. This is the land of the Aztec. The people who sacrificed their own by pulling out the still beating heart of their victims. Artifacts from the days of the Aztecs and other more ancient peoples often have images of death or murder painted or sculpted on the side. Small clay skulls line the edge of a vessel kept in a museum here in Guanajuato. It was the Aztec rituals which became the current celebration of the Dia de los Muertos. Throughout Guanajuato we’ve found sculptures of skeletons performing every day tasks: the doctor skeleton, the bride skeleton, the mariachi skeleton. Paper mâché skulls painted in bright colors are decked with butterflies. The symbols of death are beautified and even glorified. Here it’s not so creepy to display these mummies. It fits in with so much else we’ve seen here. Maybe unlike the US, death is accepted here. After all, it is part of everyone’s life. We got to see it at the Museo de las Momias. The picture above is gross. Sorry to those for whom it was too disturbing. But if you’re one of the ones who’d like to see more go here. 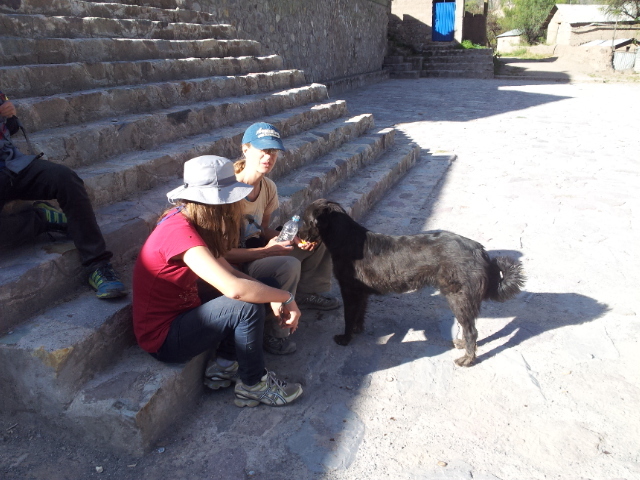 Our friend Rita came to visit us while we were in Cuzco. She’s our neighbor and one my favorite people in the world. When back in Oakland we spend a lot of time with her, watching musicals on a rainy winter night or sitting on her couch in her backyard covered in blankets on a foggy summer evening. She and I can talk for hours. We have much different views of God and religion; she’s a Catholic while I’m an atheist. But we have nearly identical views of humanity and righteousness. We had missed her a lot while we were away, and it was a delight to spend my 50th birthday with her. One day we went shopping for sweaters. We wanted to find something of high quality, not just the $5 chompas at the tourist markets. We had already bought plenty of those to fight off the cold nights we hadn’t experienced since Nepal. Cat and I each found a beautiful sweater in a small store within a courtyard. Rita found hers in the shop next door. None of our sweaters were cheap, but they were beautiful. The shopkeepers were, naturally, happy to make the sale. The woman who sold Rita her sweater was particularly elated. So much so, she shared her story. She was a shaman she said. She helped heal people. Then she gave each of us, Bill, Rita, and me, a crystal. They were crystals, she said in Spanish, from a holy mountain. She asked us if we wanted her to cleanse us. Bill went first. She took his crystal and while his eyes were closed made slow circles around his faces, then drug the crystal several times down his arms and legs and then down his back finally shaking off the bad energy. She looked tired after she was done. Next was my turn. I closed my eyes while she performed the same ritual. I felt nothing but touched that she would put this effort into my life. Bill and I both watched as she repeated the ritual with Rita. When she got to the back of her head she said, “She’s sick here.” She continued on with the treatment. When she was done Rita asked where it was that the shaman had noticed she was sick. When she was told it was the back of her head, her eyes widened. “That’s where I had my stroke,” she said. Apparently, a couple of years ago when she was having headaches, she got an MRI. At the base of her brain the doctors discovered a large, old stroke. Maybe something that happened as an newborn. This kind of is something I see in my practice. Most kids recover fully from it. Because there’s such full recovery there are probably many strokes we don’t even know about. Like Rita’s. It was while searching for something new that the doctors found something old and probably irrelevant. 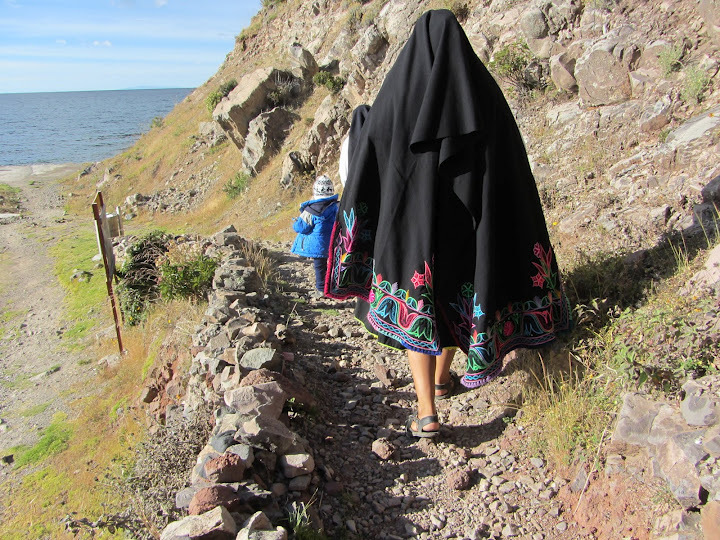 But somehow, this shaman in a small city in Peru knew that Rita was not normal in this part of her body. My rational brain says it was just coincidence. She didn’t, after all, identify my painful joints or ancient injuries. But maybe a major stroke is different under the shaman’s crystal. Maybe there’s something in that crystal from a holy mountain under the hands of this shaman that really can work a bit of magic. I’ll have to talk to Rita some more about it when we get home. She’s brought back some blankets from Peru, and we’ll sit on her couch outside in the cool Oakland summer and talk. 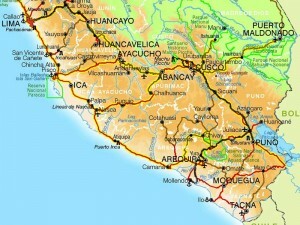 We rode the bus a lot in Peru. 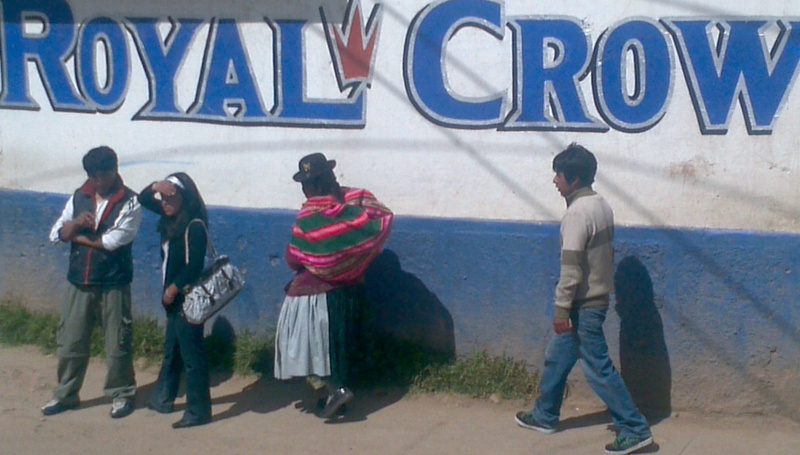 From Cuzco to Puno. 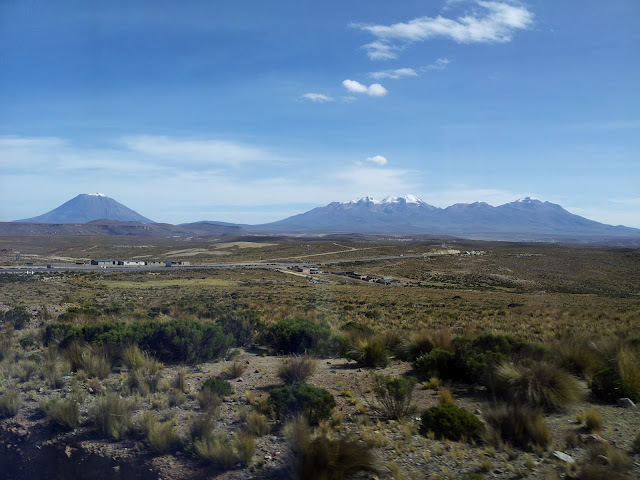 From Puno to Arequipa. 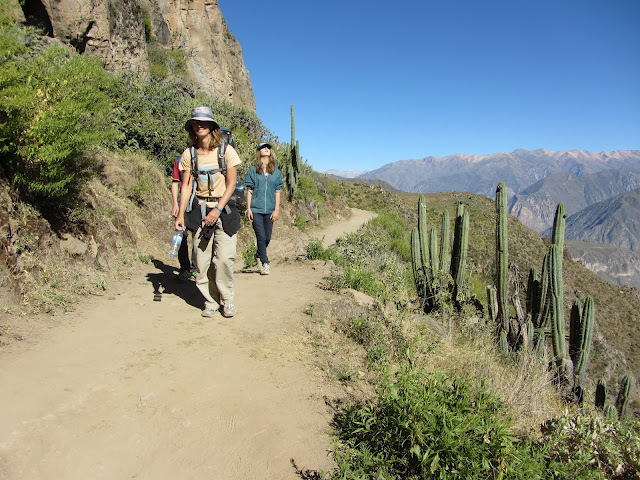 From Arequipa through Chivay to the Cañon de Colca and back again. 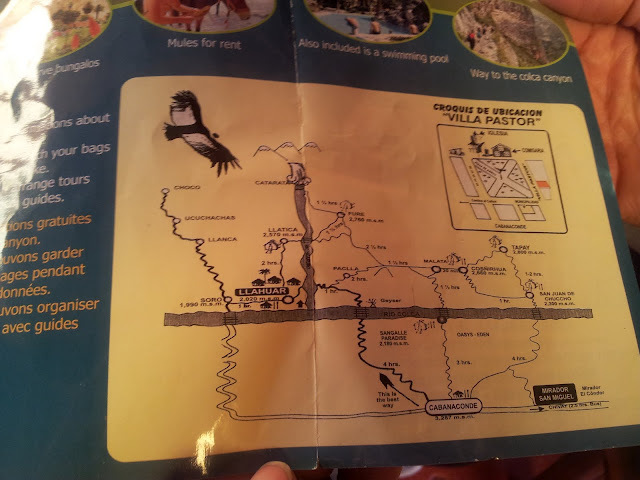 All of these bus rides took us over high mountain ranges through the alto plano above tree line. There was not much there. The mountain lakes when not wind blown reflected the snow covered peaks that tower above. Llamas were everywhere, sometimes with their llamaherd, sometimes on their own. 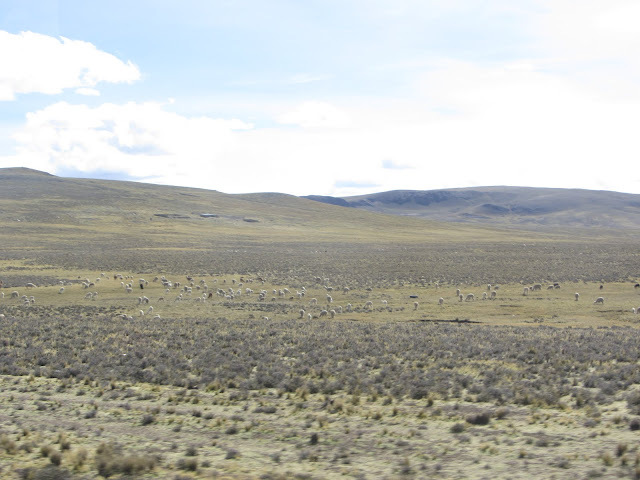 Vicuñas also grazed on the short grass that grows. On the highest mountain pass (4850 meters) between Cañon de Colca even the grass was scarce, and bright green vegetation (moss? lichen?) covered an occasional boulder. On this pass we saw hundreds, maybe thousands of balanced rocks piled on top of each other. As we’re from California, we assumed hippies had stopped along the highway to build the cairns. 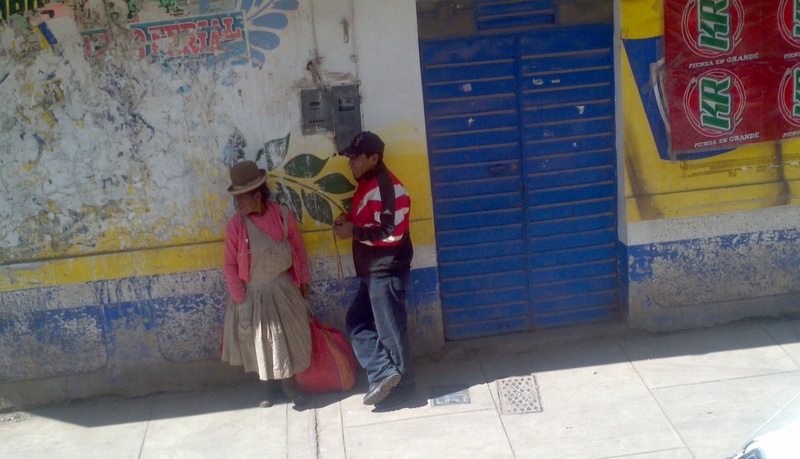 When we asked a history student back Arequipa she laughed at our assumption. No, she said, these were made by Peruvians as an offering to the apus, the mountain spirits. They would protect travelers as they passed through the alto plano, the apus more powerful than their Catholic god. 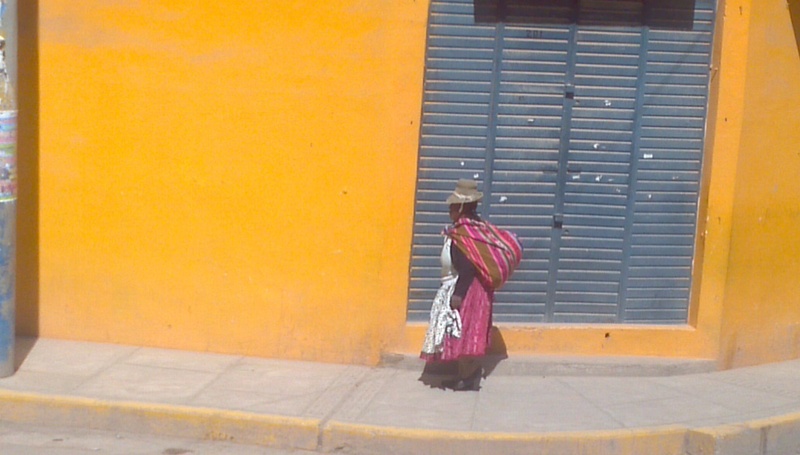 Most of the pictures below were taken from the bus as we rode from Puno to Arequipa. 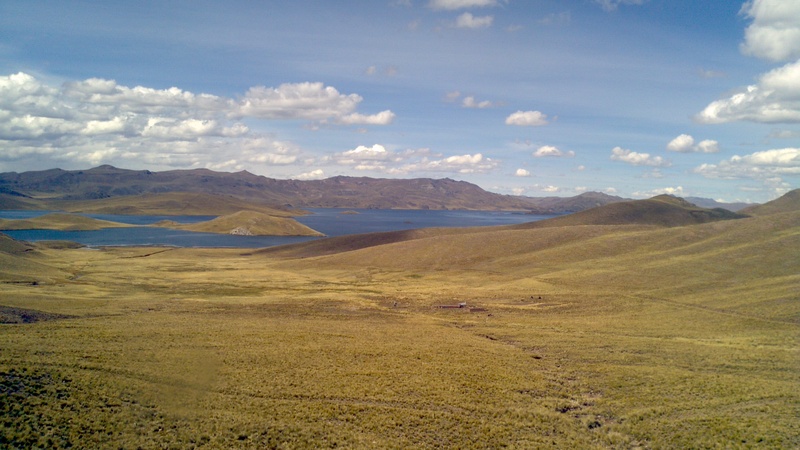 The town in the pictures is Puno. 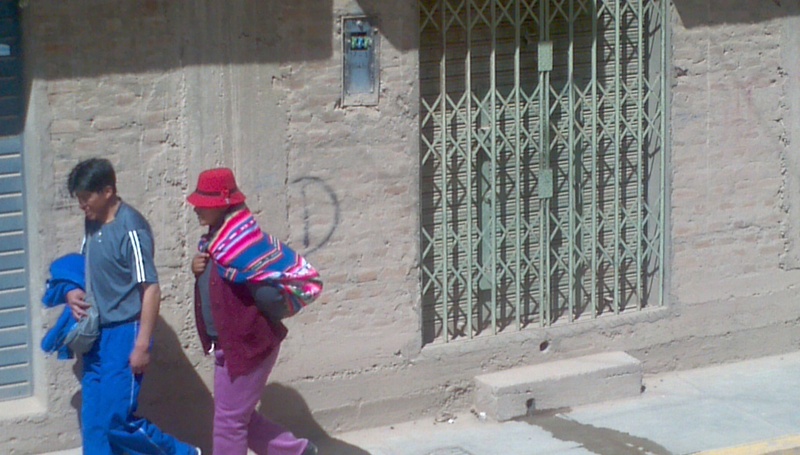 The colors of the traditional Peruvian weaving brightened the background of the dusty brown mud bricks of the homes. 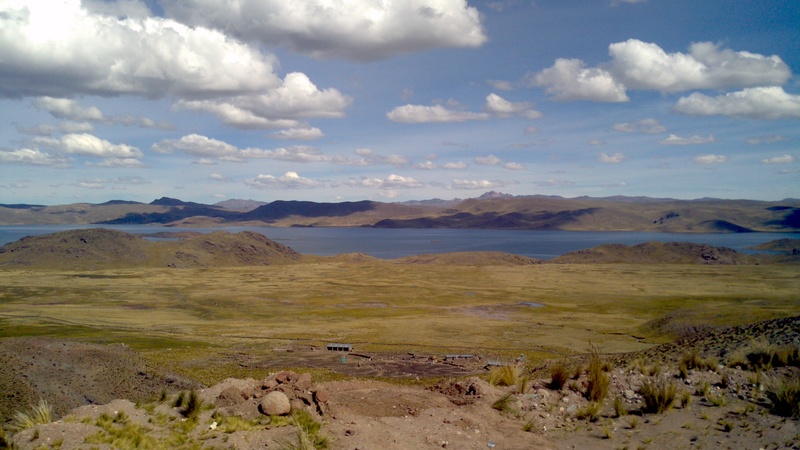 Higher up the road heads through a national park where only the vicuña share the land with llamas and their rare caretakers. 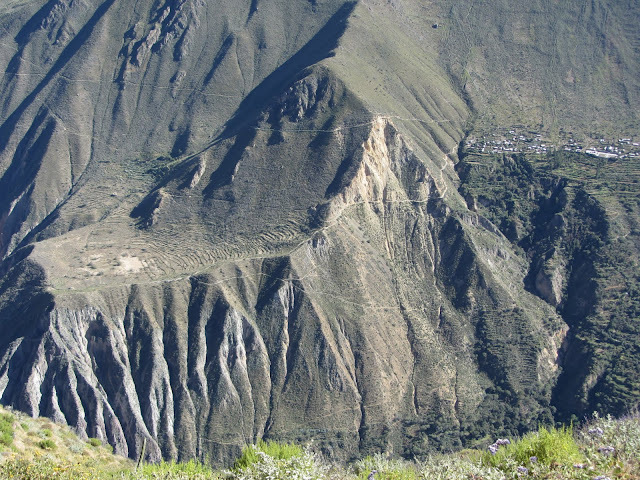 The Colca Canyon of Peru is a really deep canyon. 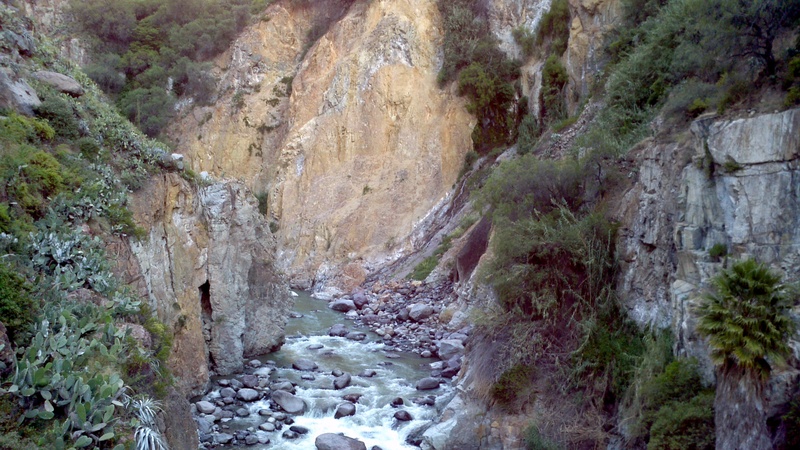 It’s said to be more than twice the depth of the Grand Canyon. 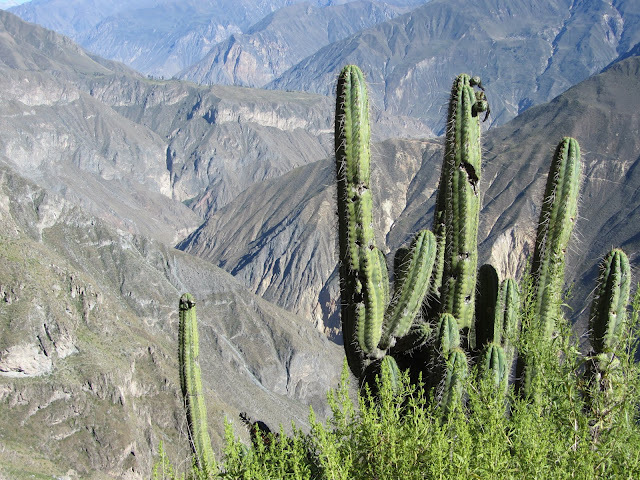 It’s only 150 meters less deep than the deepest canyon in the world, also in Peru. 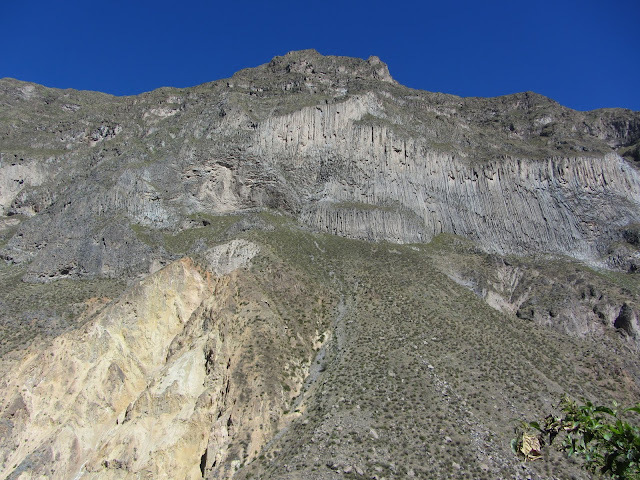 It is lined by snow capped volcanoes on one side and steep basalt cliffs on the other. At the bottom flows a swift, clear river of snow melt. Condors soar through the canyon. I had to visit. 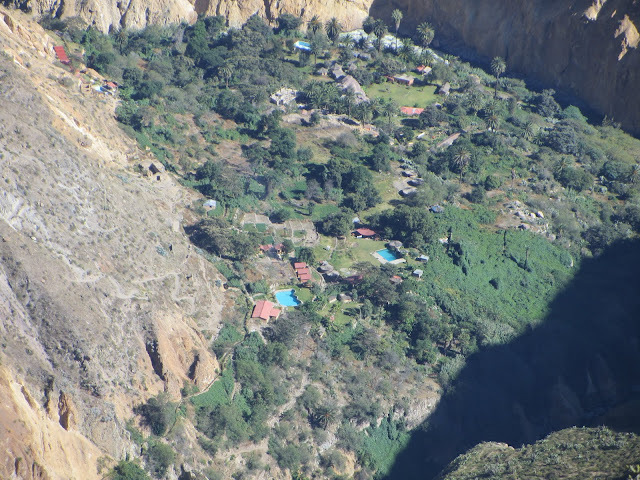 We hiked from the town of Cabanaconde at 3290 meters down to the river about 1100 meters below. We took three days, one down and around, one of rest, and one back up. 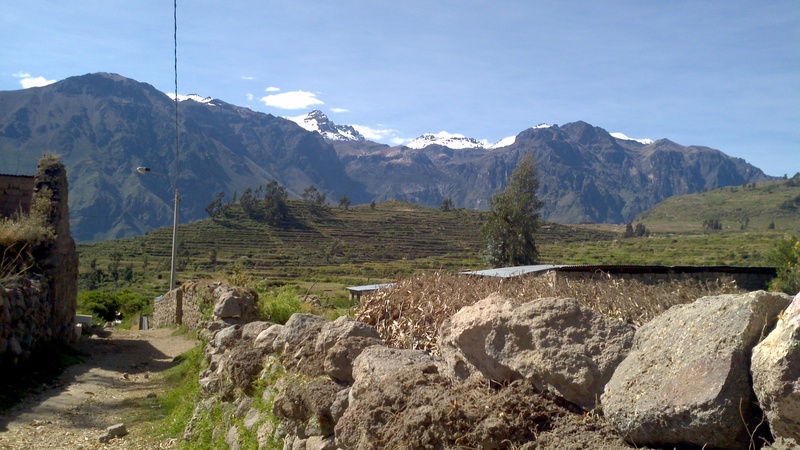 We walked between small villages that are accessed only by foot or mule. 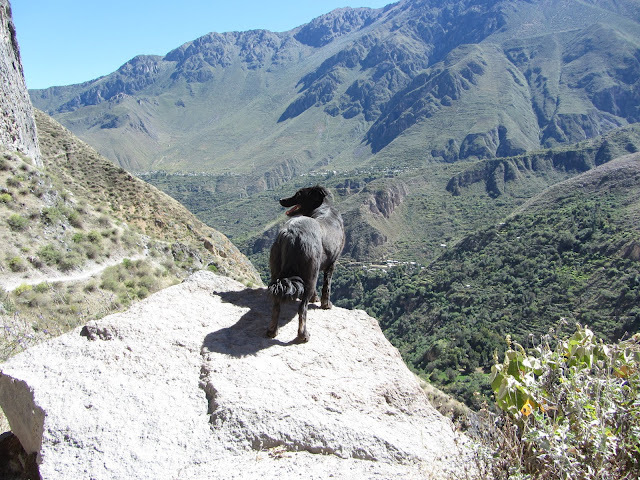 We were guided by a sweet, black dog who joined us at the top of the canyon and abandoned us in the early morning the day we started our hike back out. 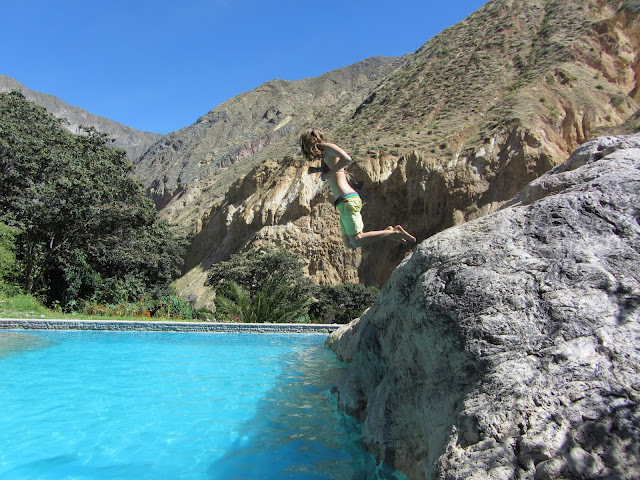 We saw condors soaring, ate the best lomo saltado (alpaca sauteed with pepper, onions and lots of salt), and swam in a pool while soaking up the sun. We found waterfalls, basalt cliffs, dry, dusty village plazas, and sweet, green oases. We suffered blisters, sore knees, and a few tears. 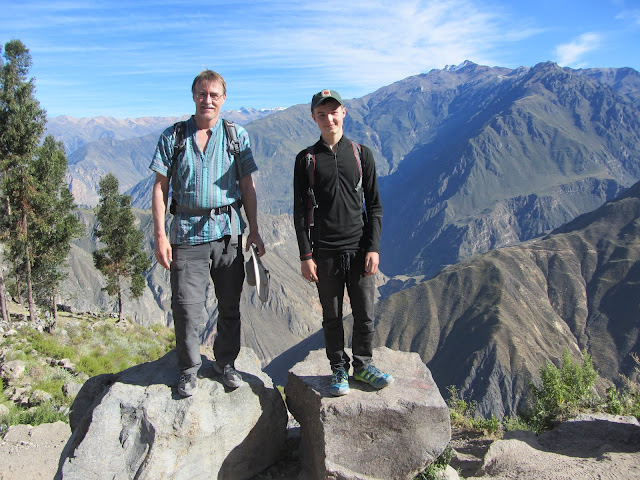 We experienced the depths and the heights of the Cañon de Colca. Like my post on hiking in Nepal, this is a better story of pictures rather than of words. Move your cursor over the photos for a description. Again, Bill took most of the photos.